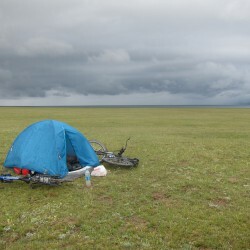 We woke to rain still pounding our tent on and off, so waited for it to clear to get going. 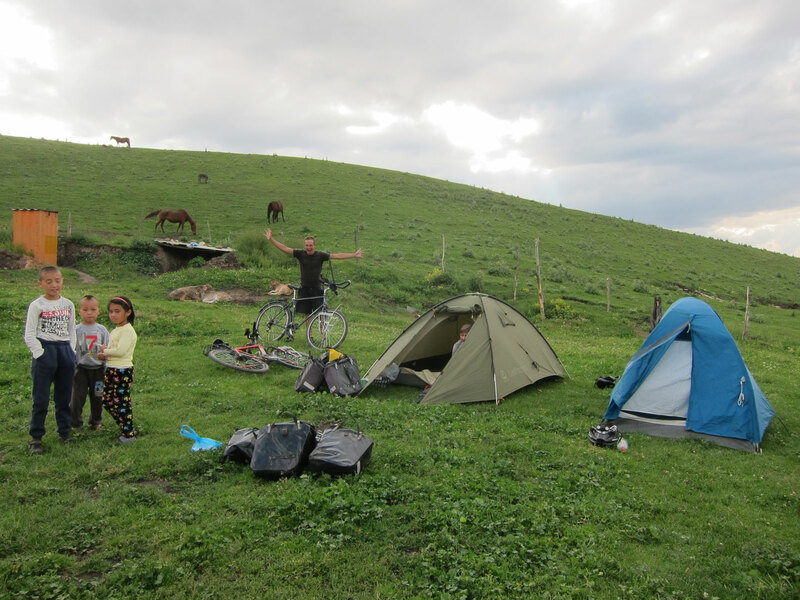 In a break we started packing, rolled our sleeping bags, only for another big thunderstorm to hit. I’ve seen at least 5 of them rolling over the lake now – what’s wrong with the weather here? After this one we had a long enough break of rain to pack up. 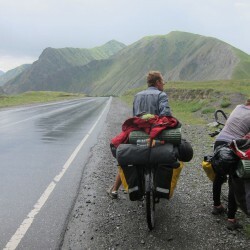 Soon after starting to cycle the rain started again. 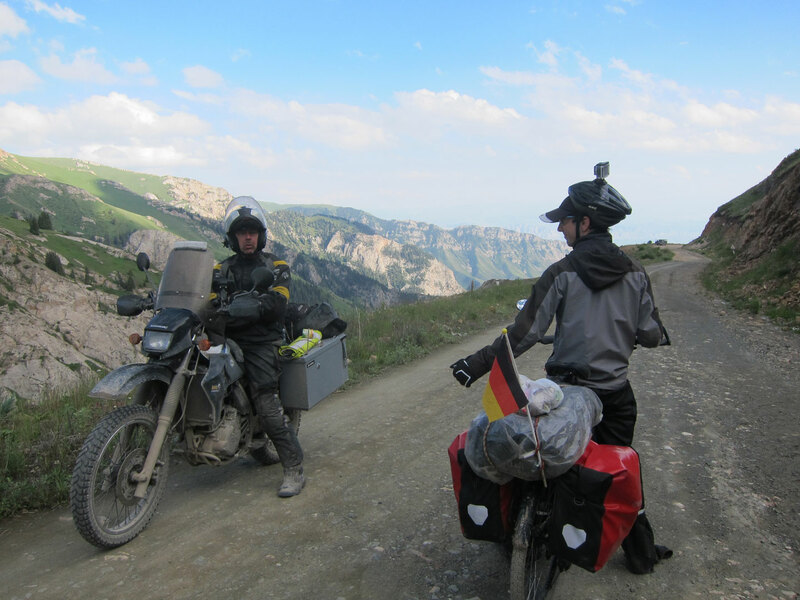 Some Swiss motorbikers stopped asking if we need any help, but I didn’t know how. Coming over a hill I saw an almost pitch-black cloud heading straight towards us. 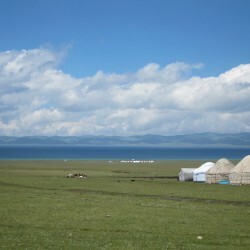 I suggested we head to the nearest yurt for shelter. 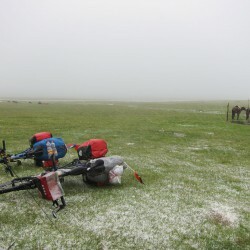 All of these yurts are a bit of a distance from the road, and while we were riding over the grass towards one the hail started. 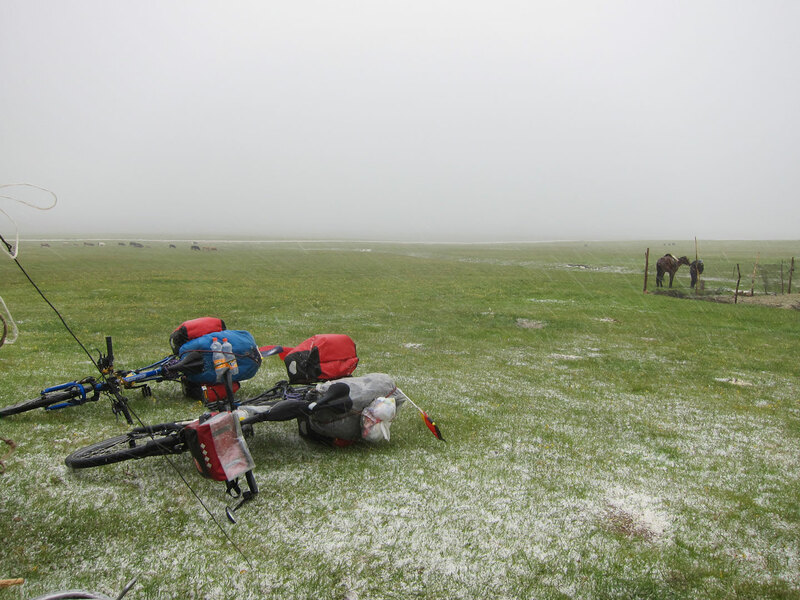 It was less than 100 m to the yurt but the now heavy hail hit us like millions of little rocks. It hurt like crazy, so that I resorted to pushing. 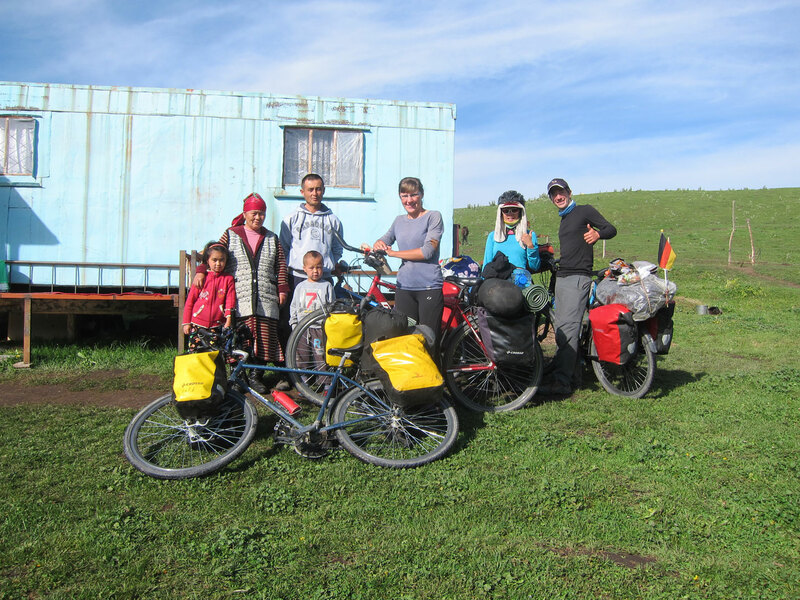 After making it to the yurt, whose surprised inhabitants invited us in, I ran back outside to help Yuily pushing her bike there. Finally we were in and un-froze ourselves at their stove with some hot tea. What a crazy weather encounter. 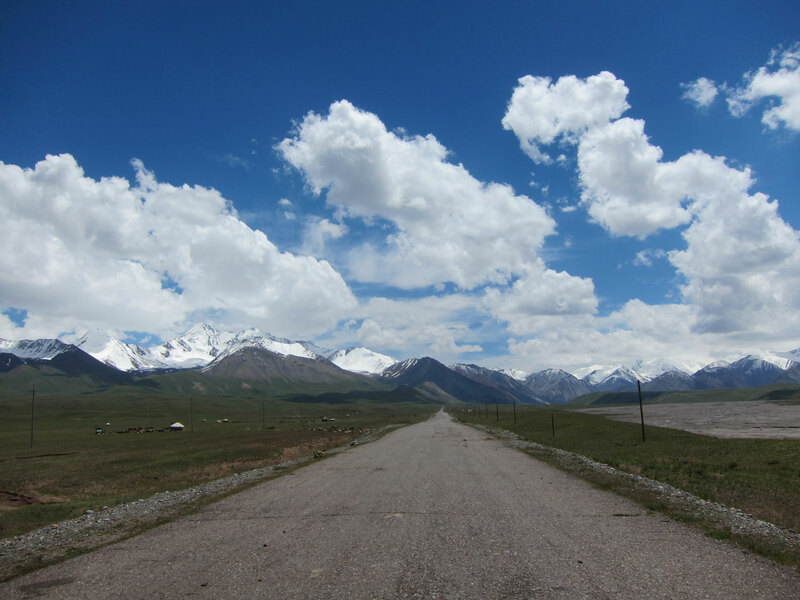 After the hail cleared, finally Song-Kul presented itself to us in its glory with most of the clouds gone. 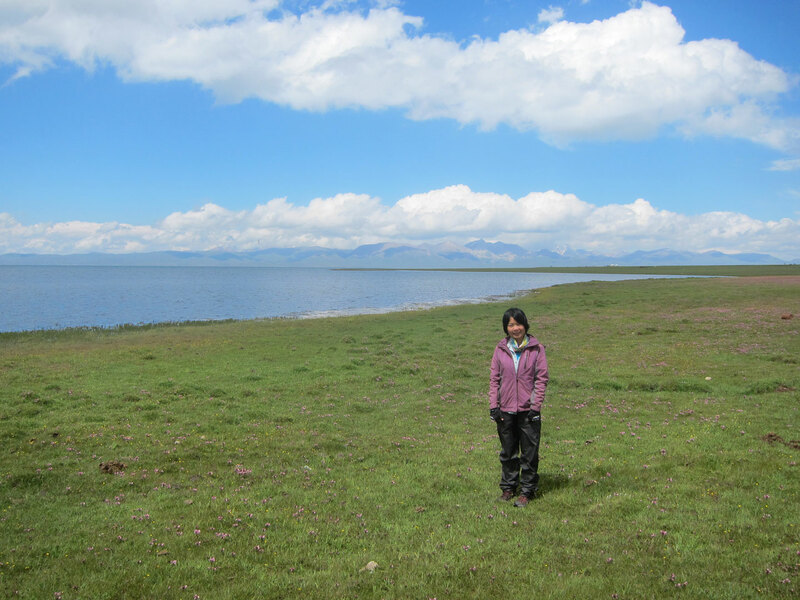 At 3100 m, it’s perplexing to have such a huge lake, all above the treeline. A beautiful place. Unfortunately, the hailstorm made the roads a muddy mess. 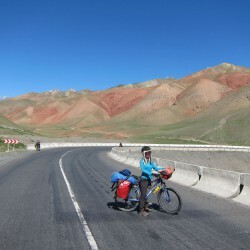 We made slow progress and slowly turned away from the lake, over a pass, down from the mountains. 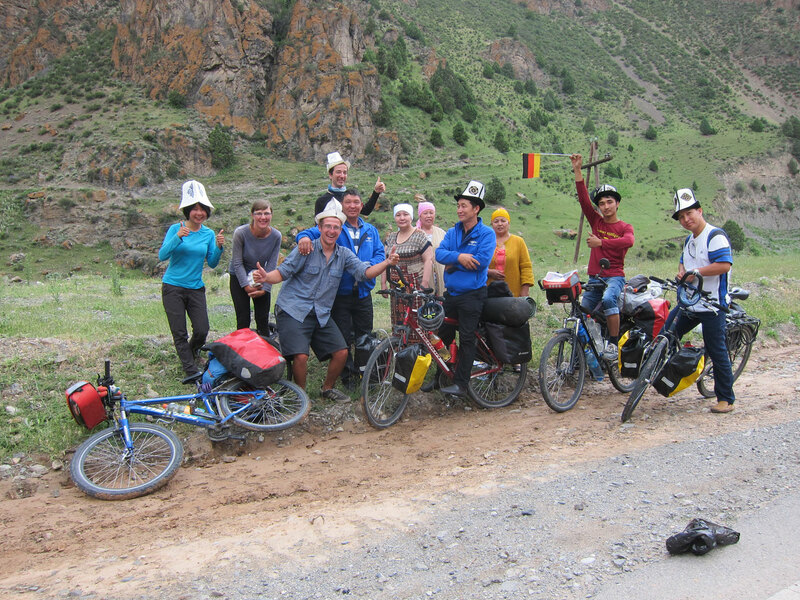 On the way, Kyrgyz kids got annoying again as two rode their horses next to us, constantly asking us to give them our flags. They didn’t seem to understand all the variants of “It’s mine, you cannot have it” and kept persisting. We constantly watched them as it seemed like they waited for a moment to steal a flag and run off with it. Finally after a few km they gave up. Climbing up to the bowl edge of Song-Kul at 3300 m, a major downhill waited for us. It was already 5 pm due to all the delays with the weather so far, but it looked so spectacular we had to take a few more photos and videos. 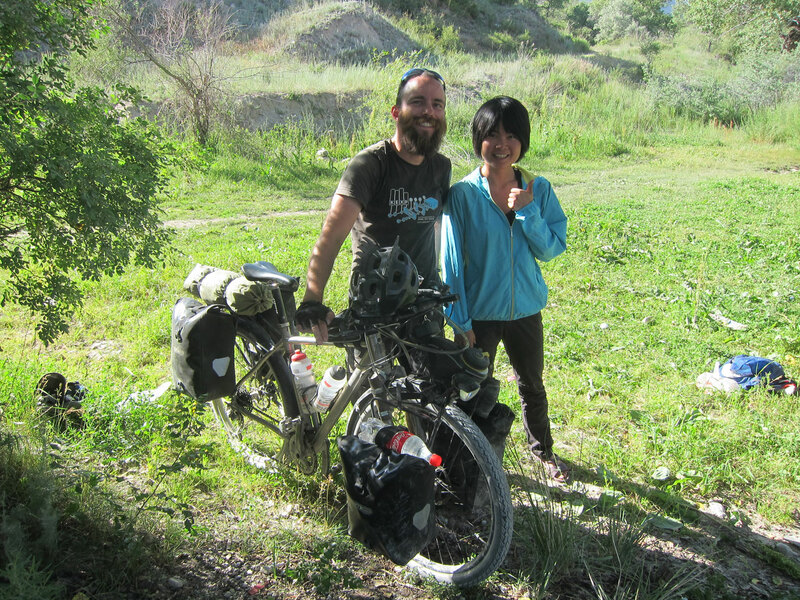 On the way down we were stopped by an Irish motorbiker who told us of a beautiful camp spot 20 km down the road. 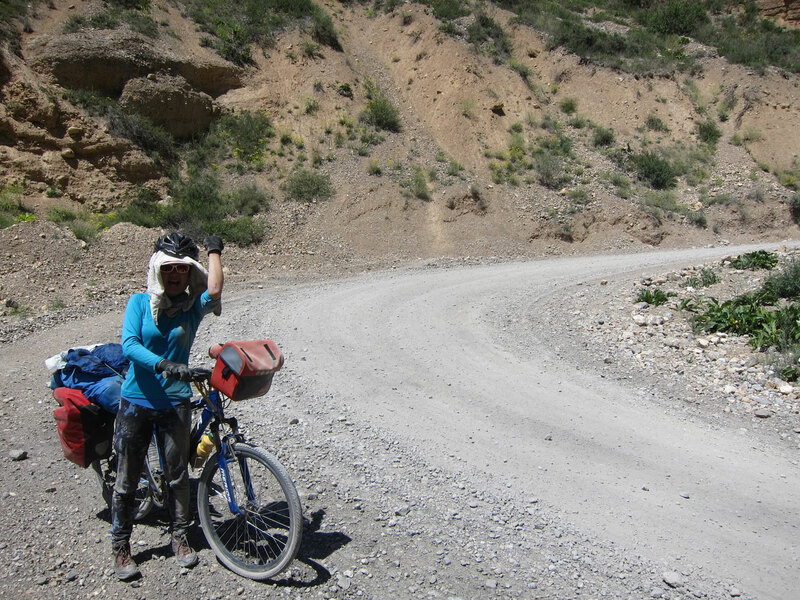 The road went over countless switchbacks, all on gravel intersected by stream-ditches. More dangerous than fun, at one of them Yuilys leg hit her chainring which left a few nasty scratches. We continued on. 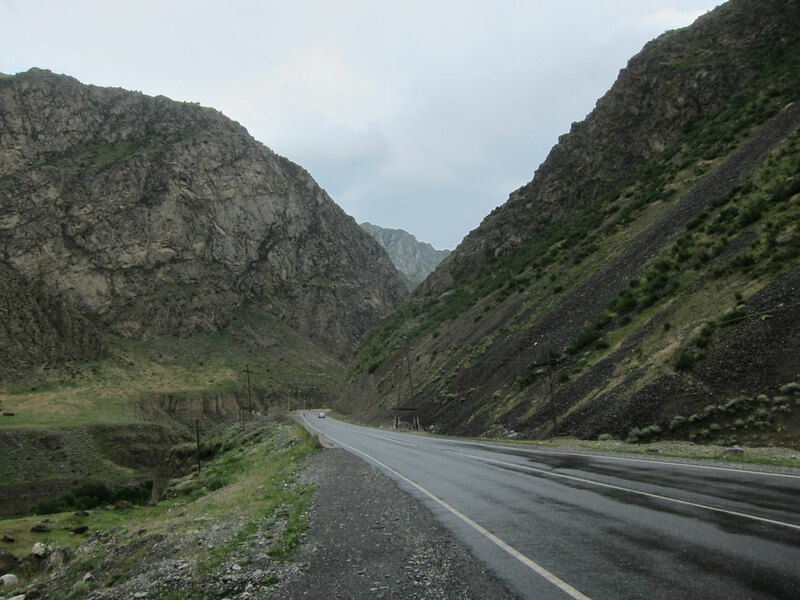 We then went through an impressive canyon all the while having an ever growing stream next to the road. 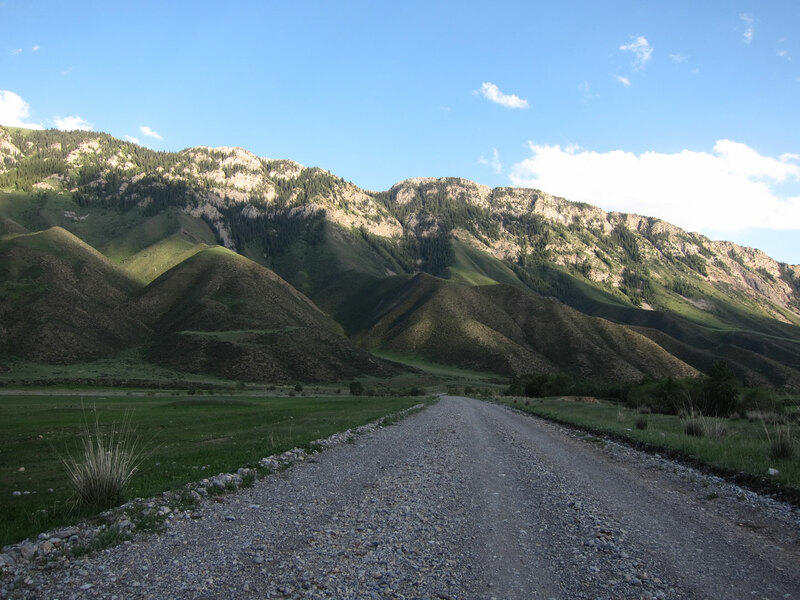 A lot of spots were already beautiful for camping, and we were seriously considering one of them, but decided to push on. 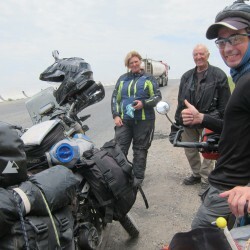 On a next one, which might very well be the one the Irish motorbiker was talking about, it was beautiful enough that we gave up and pitched. Fading light close to 8 pm reinforced that decision. 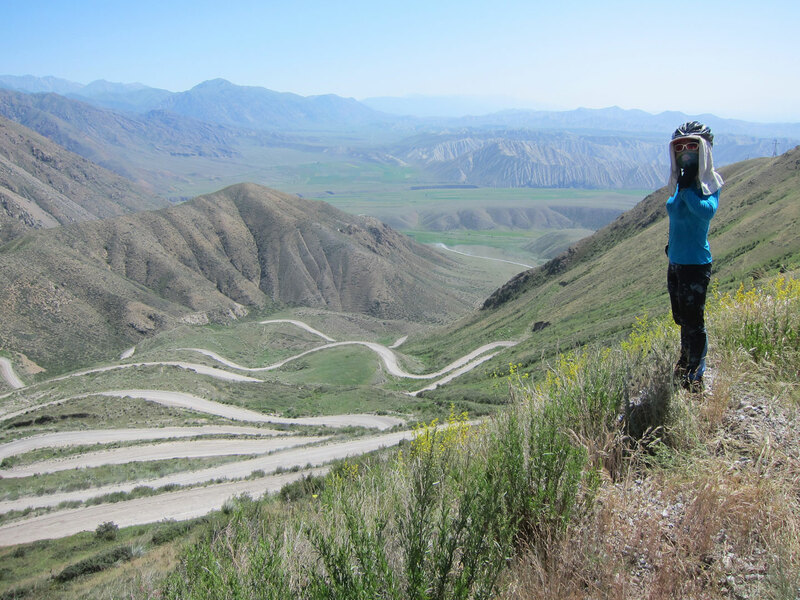 Doing some route calculations, I came to the conclusion in the tent that we were running too short on time if we were to cycle all the way to the Tajik border. 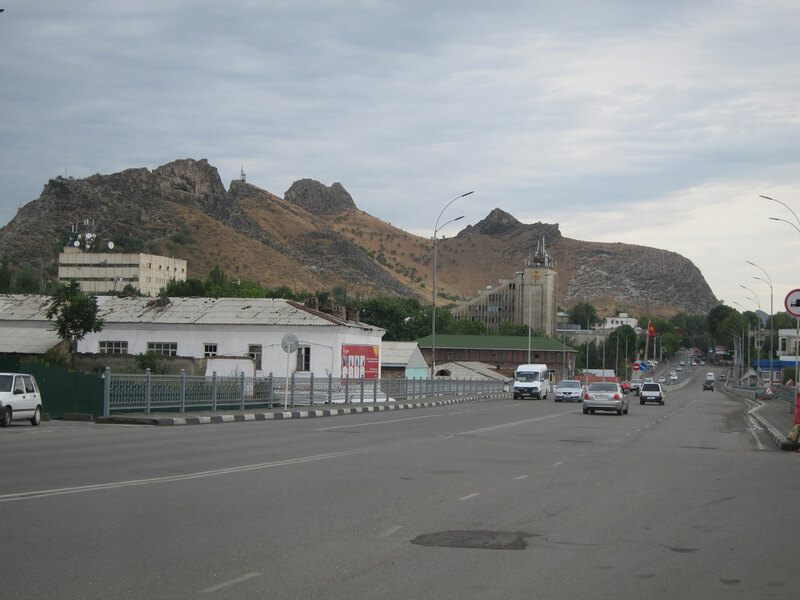 We could theroretically make it, but without a rest day in Osh, which would be an absolute neccisity. 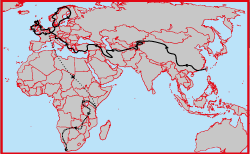 Taking a truck or van was unfortunately going to be a thing again. This girl gave Yuily some candy. Yuily returned the favour. 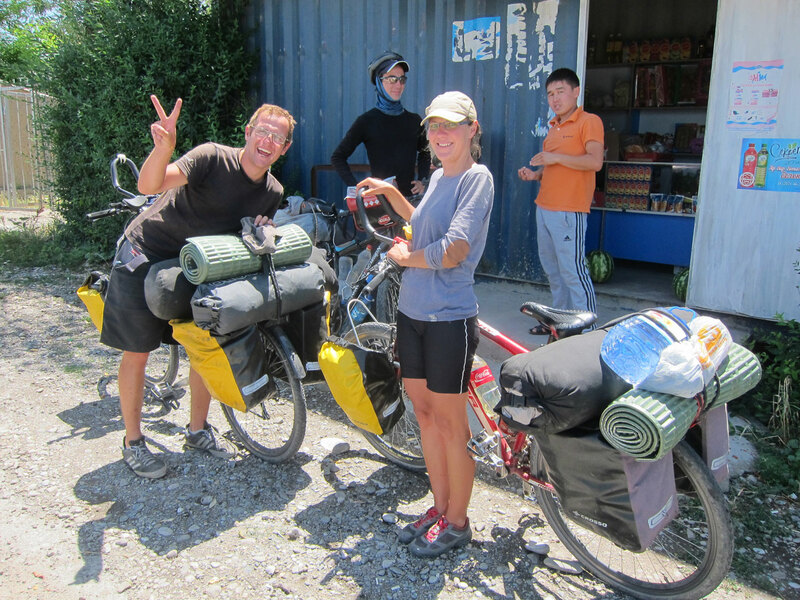 We cycled another 10 km downhill towards the small village of Dzhany-Talap to restock on food and hoped to find a delicious restaurant as we were getting sick of noodles and bread and we needed to charge electronics. 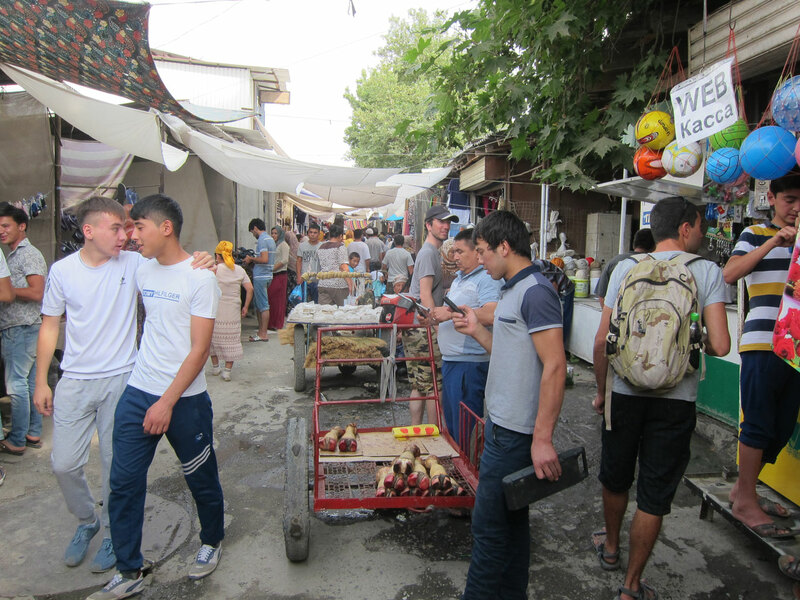 Arriving, we found a rather poor post-soviet village with only a few dusty shops. On one we asked about a cafe when the owner mentioned there is none in the village, but he gladly invited us to tea and bread and let us charge our stuff. 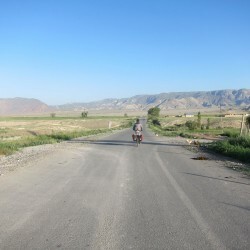 Moving on, OpenStreetMaps lead us to a dead end out of the village, wasting several km, while Google Maps was absolutely worthless in this region. 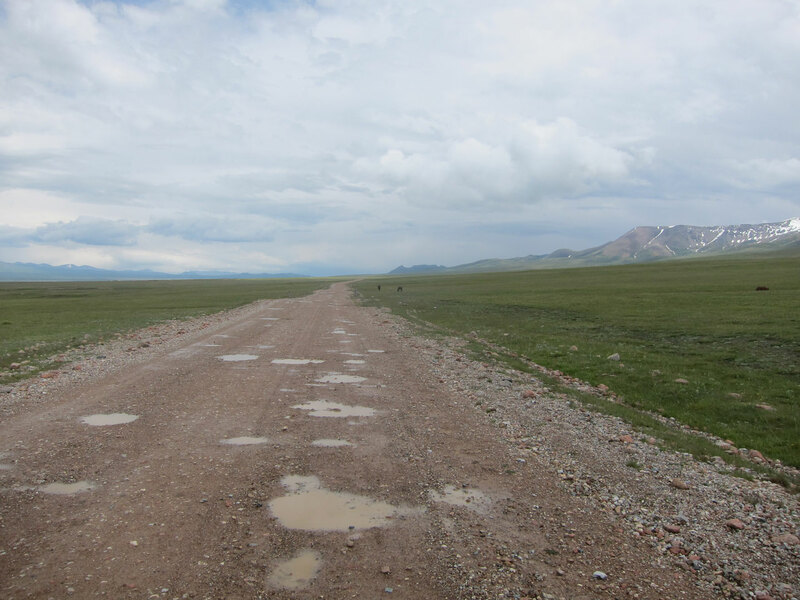 Backtracking and finding the correct road westwards, we were met with a deep gravel surface that had us suffering. 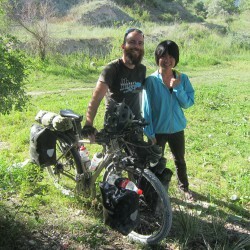 Additionally, the sun was beating down like crazy, making us feel very hot, while there were no shadows. 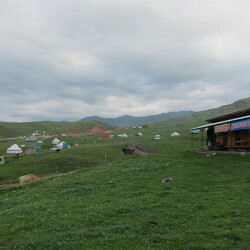 The next village on the way would be a clear stop to have a cold beer. 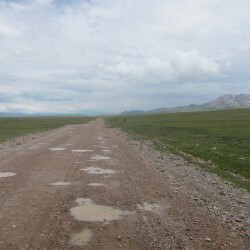 Unfortunately the Soviets decided to build the road to there straight over a hill instead of around it. 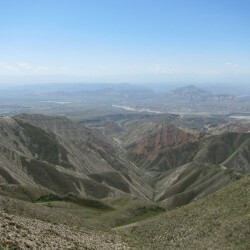 Climbing it made us feel very dizzy in the heat, possibly giving us a small heatstroke. 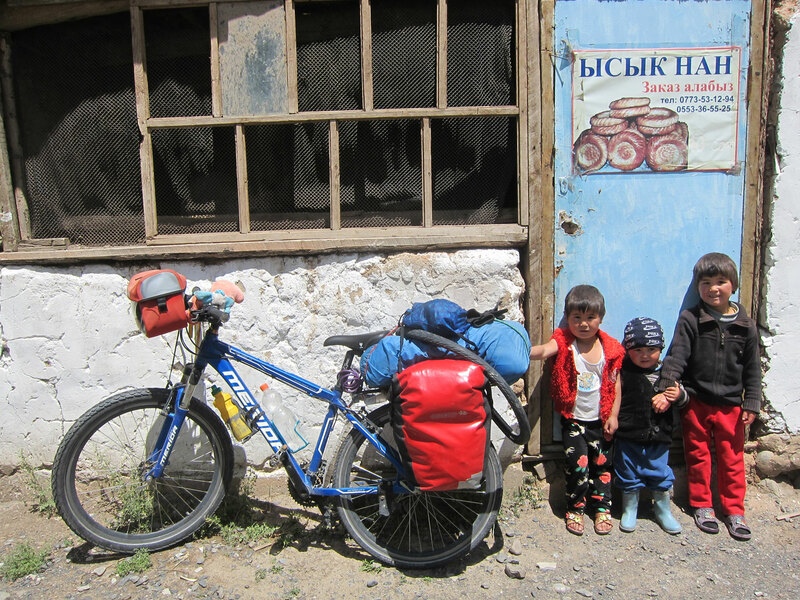 Arriving in Kek-Dzhar we were greeted by a tarmac road and well-kept houses. It was a very nice place. 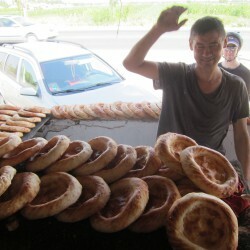 A man invited us in for tea, which we gladly accepted in our exhausted state. 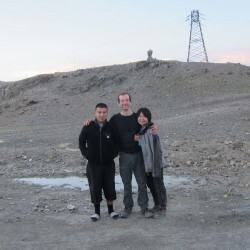 We spent a good amount of time talking to his daughter, who worked as an English teacher. 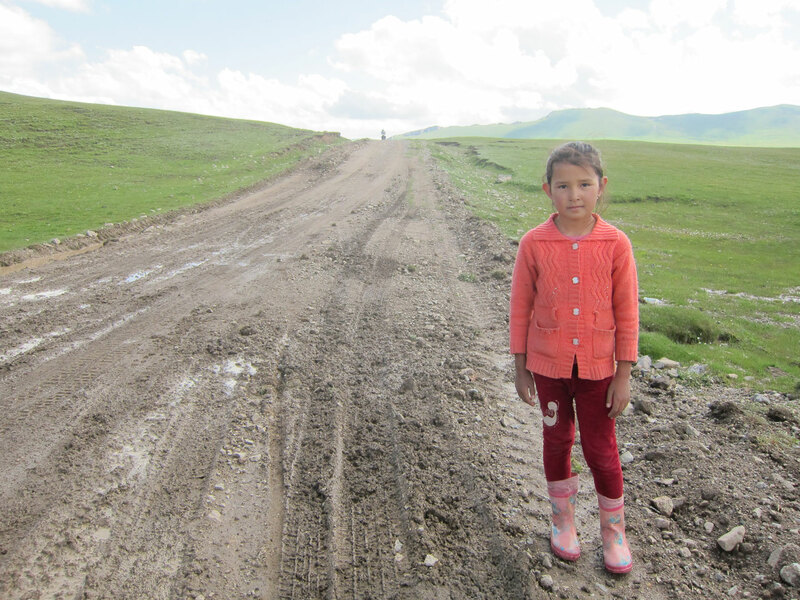 After she showed us their garden and served us plenty of tea, bread and Kumus, we debated our options. 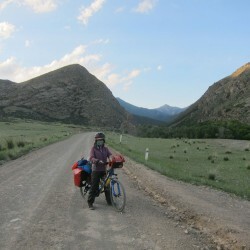 We still had over 200 km of gravel ahead of us with relentless up and down in between. 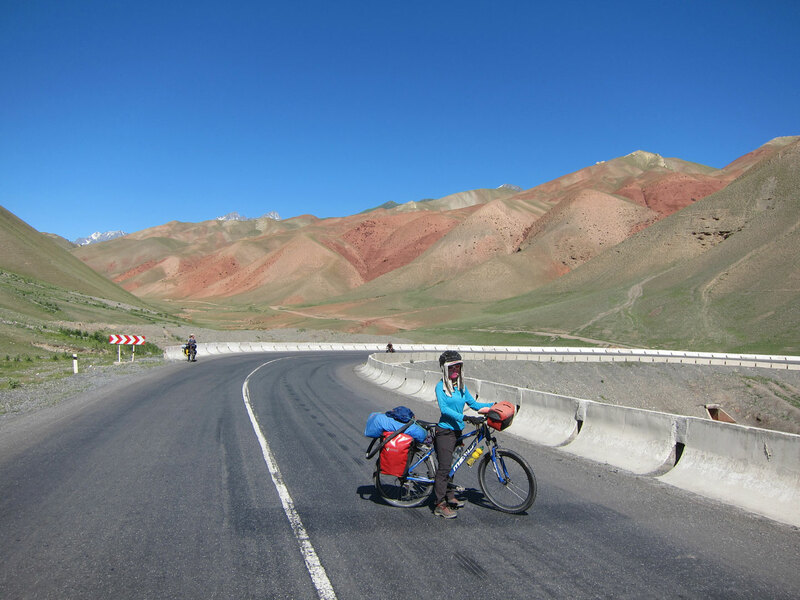 Cycling all of it and then on to the Pamir mountains of Tajikistan with no rest was not an option, especially since the high Pamirs are not very good for actual resting. 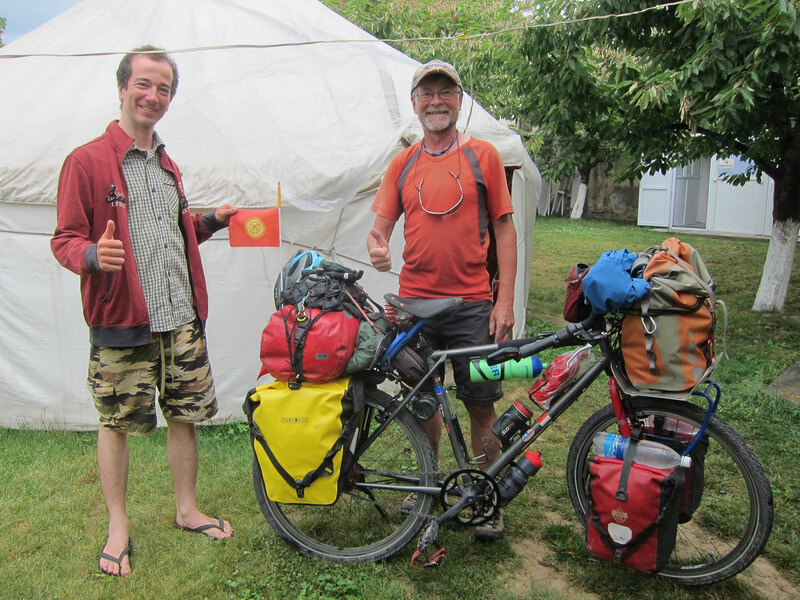 It pained us both to not cycle all the way through a country again (after China) and I admitted that taking the loop around Issyk-Kul was the thing that left us with so little time. 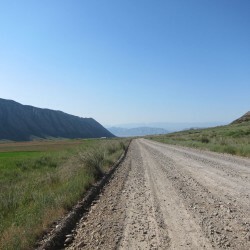 We therefore decided to cycle to Kazarman in two days, the next town around 110 km away, and from there take a lift over the biggest pass and, as we heard, the worst of the gravel, before the glorious asphalt began again in Jalal-Abad. 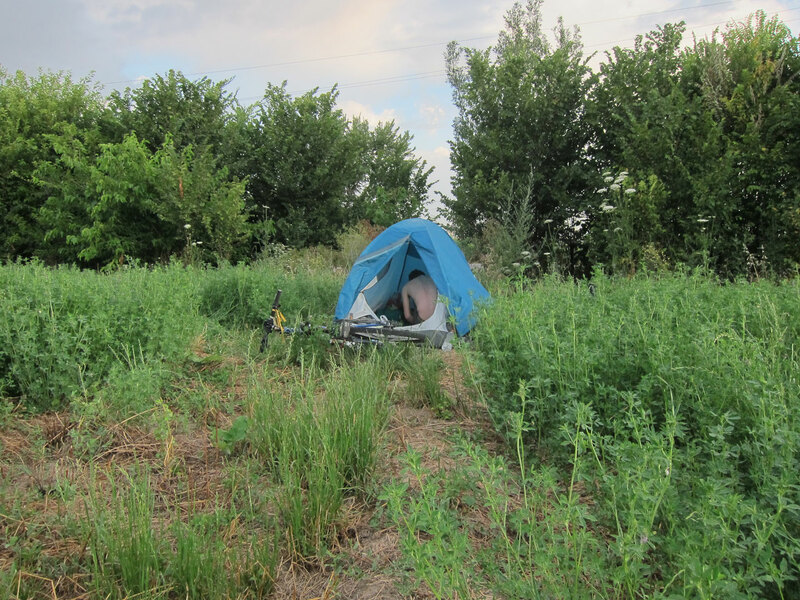 Since it was evening now, we asked about camping in the yard of our invitees, which they gladly accepted. An early morning start was planned to beat the heat. It worked and we were out by 6:30 am. 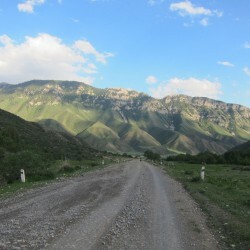 The nice tarmac of the village became gravel again soon and threw us on one of the toughest climbs yet. 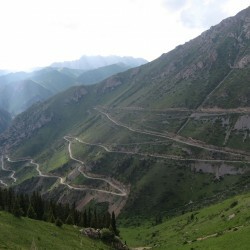 Kek Dzhar and Kazarman were both on the Nayrn river, but instead of following that, the Soviets decided to build the road over the mountains, doing 3000 m passes. The why was a mystery to us. 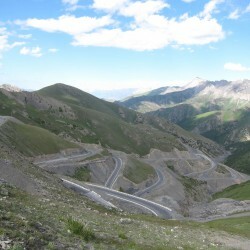 Similar to the descend from Song-Kul, there were countless switchbacks on a mountain ridge. Only this time, we had to go up. It was extremely slow, but very beautiful and by 1 pm we were finally at the top. An equally steep descent followed. The road went through a canyon but still switchbacked quite a bit. 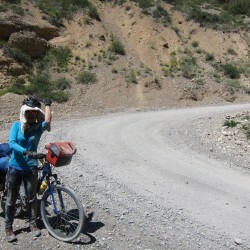 On one of these I heard Yuily crashing behind me as the gravel and dust gave way below her tires. I raced back and helped her up. 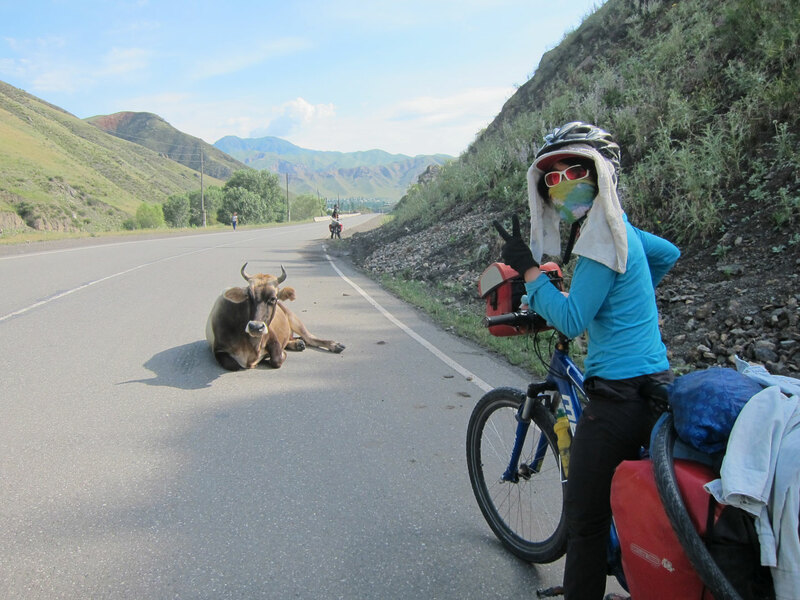 She had several scratches including a nasty one on her arm, but claimed she could cycle on. We had to get off this downhill. 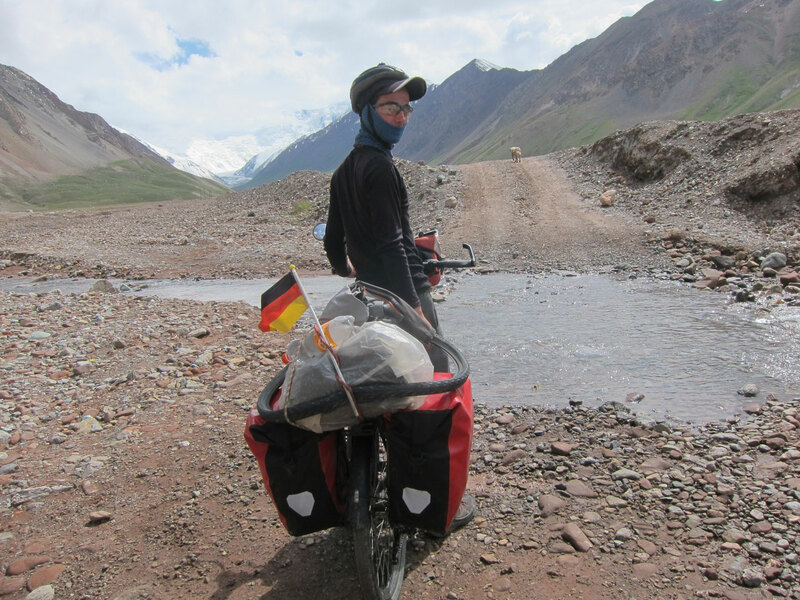 We reached the bottom at a smaller creek and had a long break there to wait out the worst of the midday heat and let Yuily recover a bit. 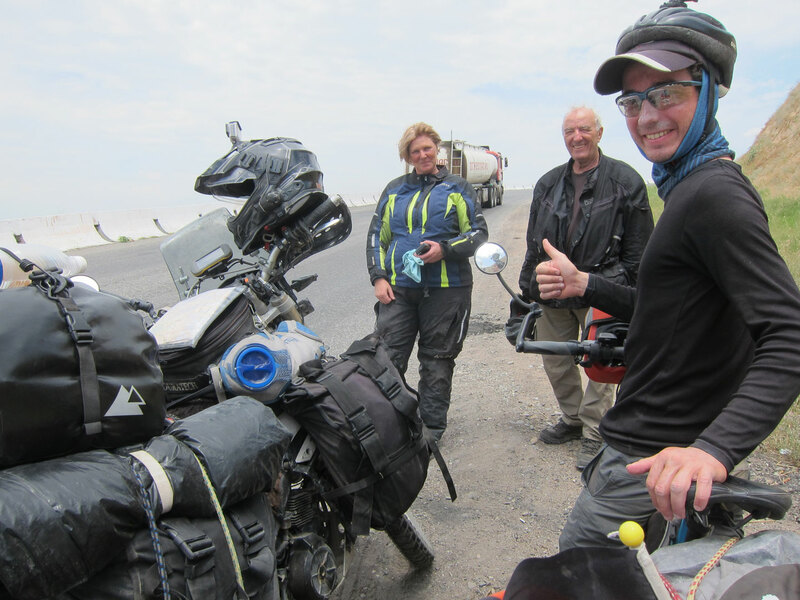 While we rested, a trio of dutchmen in jeeps and an American cyclist showed up. 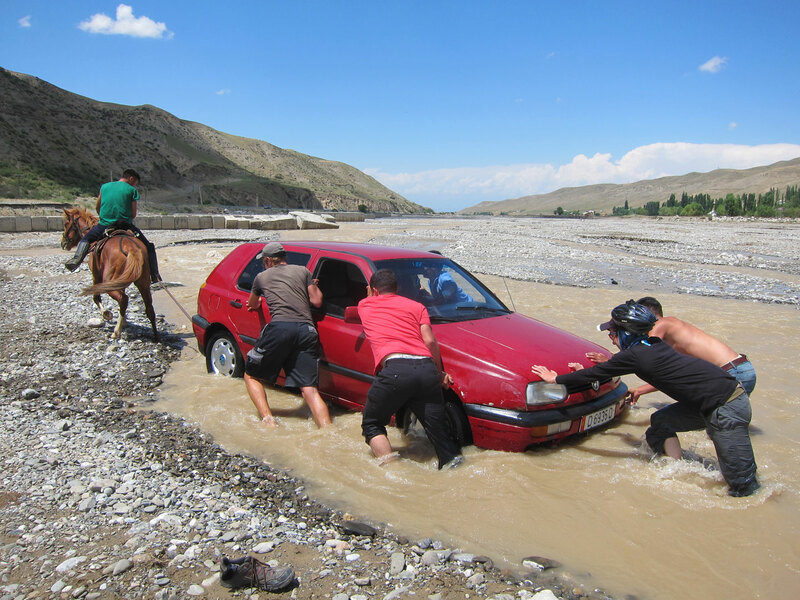 The huge amount of overlanders we meet here in Kyrgyzstan continues to impress. 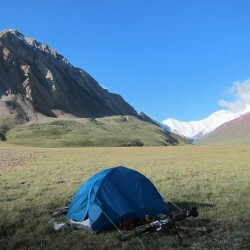 I suggested to make it to the next creek, 10 km away before making camp, which Yuily accepted. 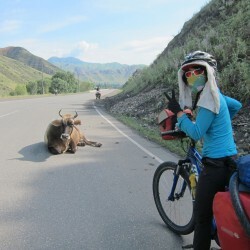 Unfortunately the crash had a mental effect on her and she didn’t dare to cycle further. 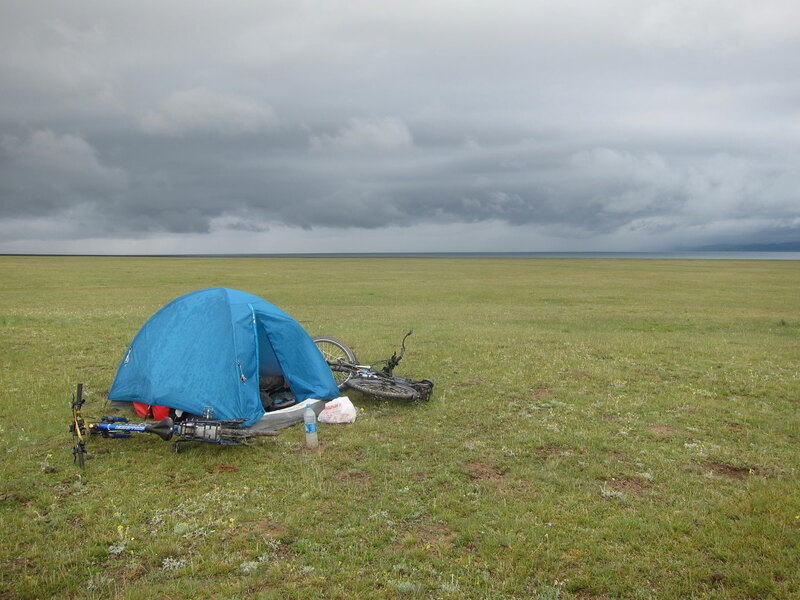 After 3 more km, we camped on a flat spot next to the road instead. I was disappointed, but of course couldn’t blame it on anyone but higher circumstances. 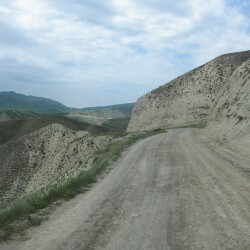 65 km tomorrow on these terrible roads to Kazarman seemed very hard, but we still wanted to give it a try. These spoiler titles are no fun, right? We got up early again to give the run to Kazarman a try. 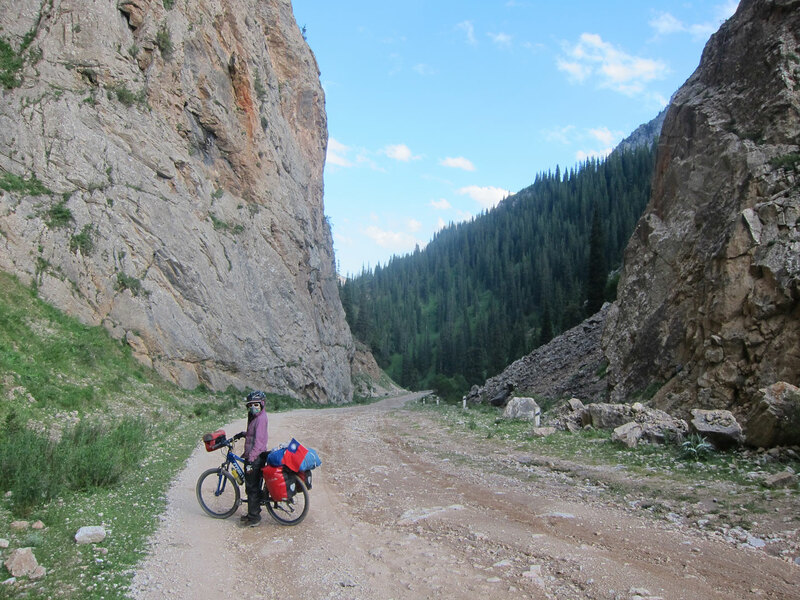 A short uphill from our campsite brought us over a small pass. 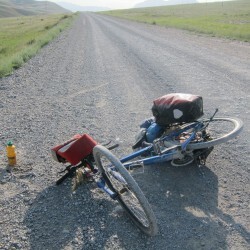 My bike has less rolling resistance than Yuilys, so I usually roll ahead on downhills and wait for her at a suitable spot. This time, I waited for a minute and she didn’t show up. I glanced up the hill and saw the reflections of a bicycle lying on the ground. “Not again!” I thought and raced back up the hill. 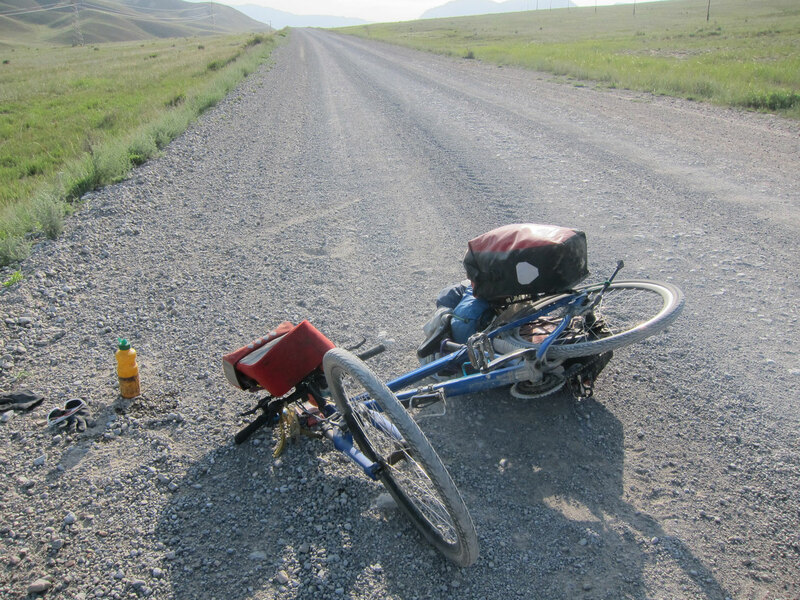 Yuily crashed again, this time crossing the gravel bump between the tire tracks, her front wheel just gave away and the bike landed on her back. No serious injuries, but what was much bigger was the psychological damage – after two crashes so short after each other, she lost all confidence to cycle downhill on gravel by the second crash. Screw Kazarman, we needed a lift out of here now. 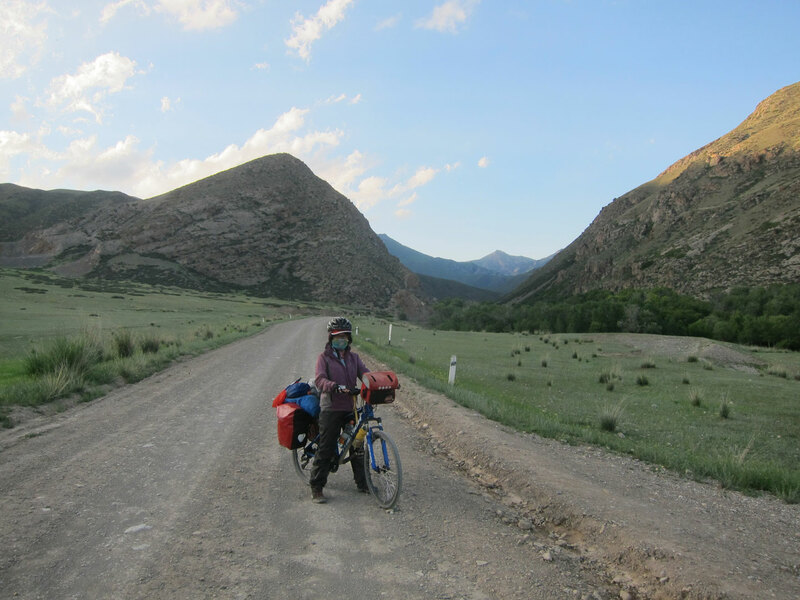 Traffic on this road was very low, so we still pushed on to the next small creek to have a water source. 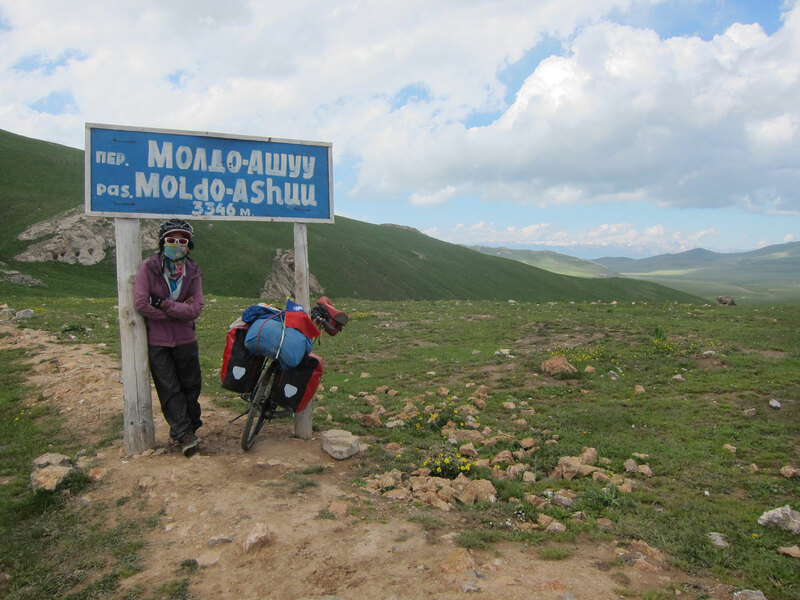 And I mean pushed, as Yuily was very fearful of crashing again on a downhill. 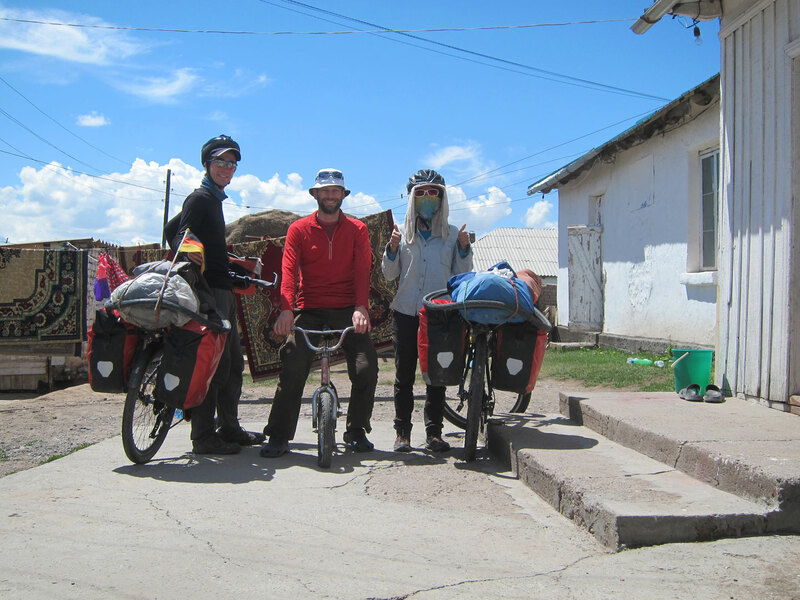 We made it in a short time and set ourselves up for hitching. 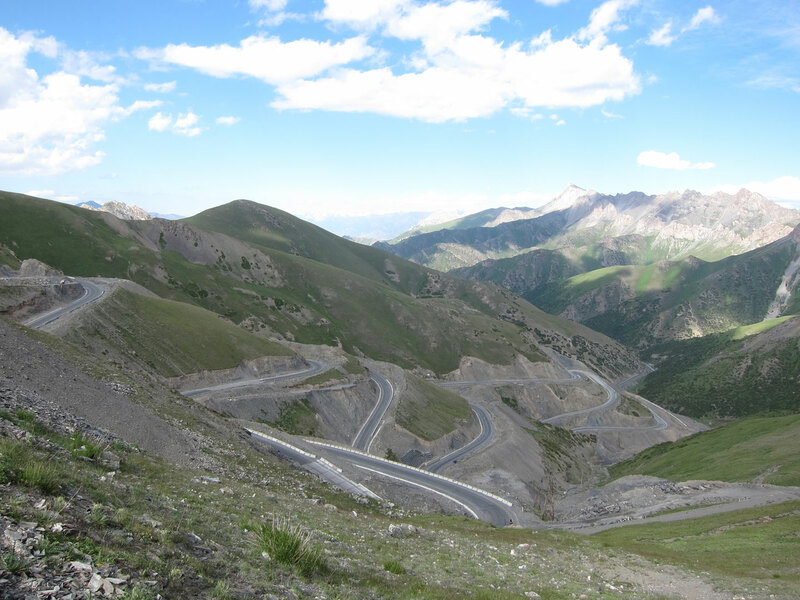 After a few hours, a truck agreed to take us to Kazarman for KGS500 (it’s customary to pay for the ride in Central Asia). 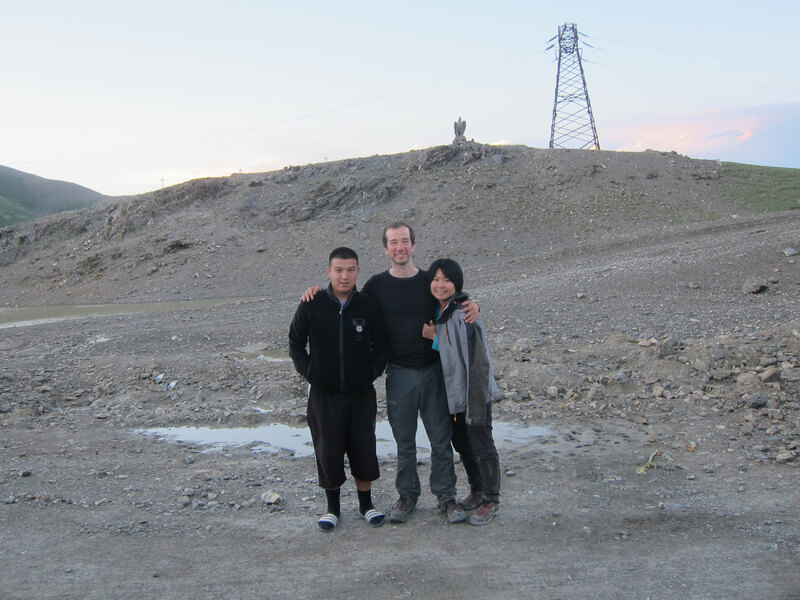 There were many more up- and downhills on the way there which made us happy for the lift. 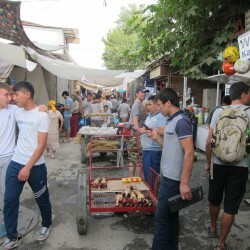 Arriving in Kazarman at 3 pm, the mission was to find onward transport. 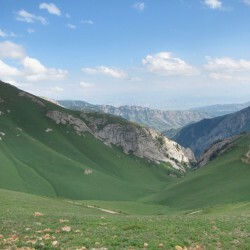 The pass is so steep and gravely that the government recommends only 4WD cars on it, which run between here and Jalal-Abad, starting in the morning. 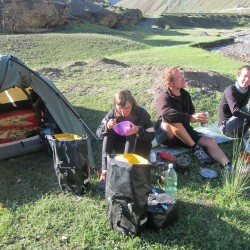 We enquired at a guesthouse and restaurant, receiving several offers, the cheapest being KGS3000. 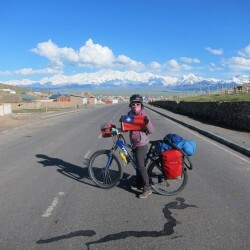 Too much for us – we decided we would ride out of the town, camp and try the next morning to hitch. 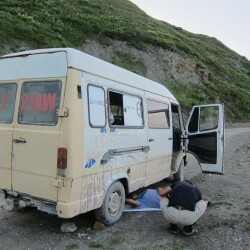 Just as we were riding out, two men, preparing their van for departure, called out to us. 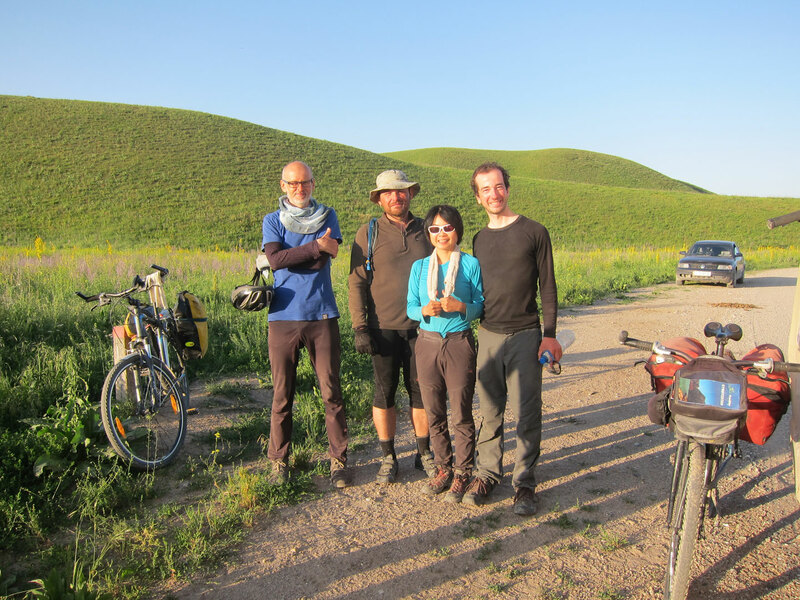 They had to run the vehicle empty to Jalal-Abad for something and happily agreed to take us and our bikes for KGS1200. We accepted and were very lucky to have found them. 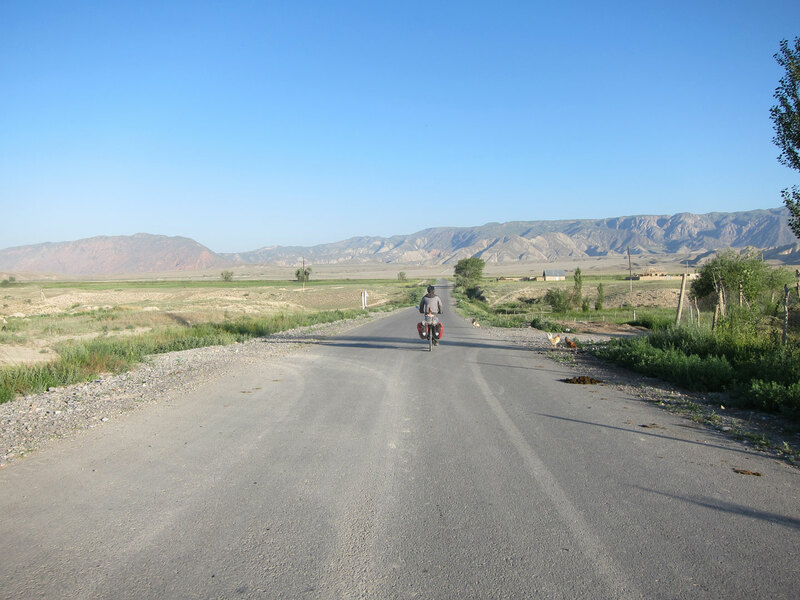 The driver was an absolute legend, making absolutely sure our bikes are secured, re-tying them many times with ropes on the way and offering us to stay at his place in Jalal-Abad. 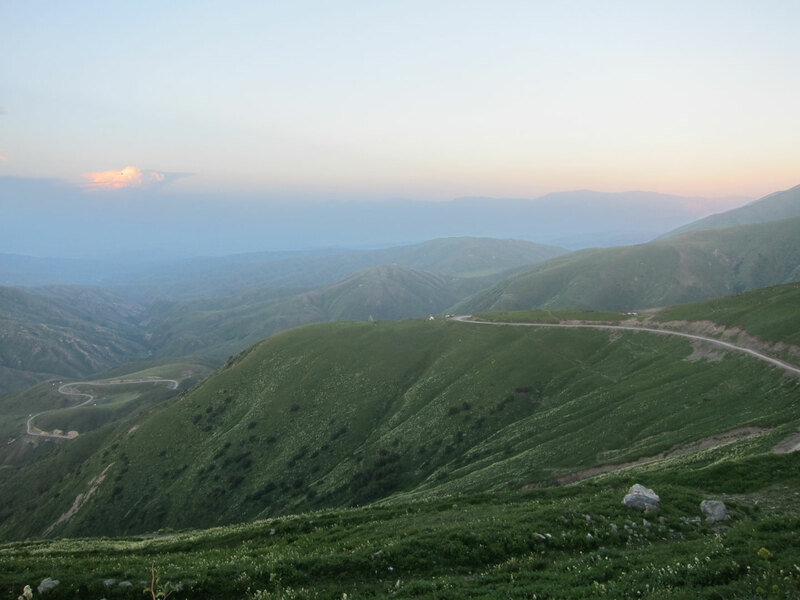 Luckily we made it up the pass just before sunset, giving us great views. 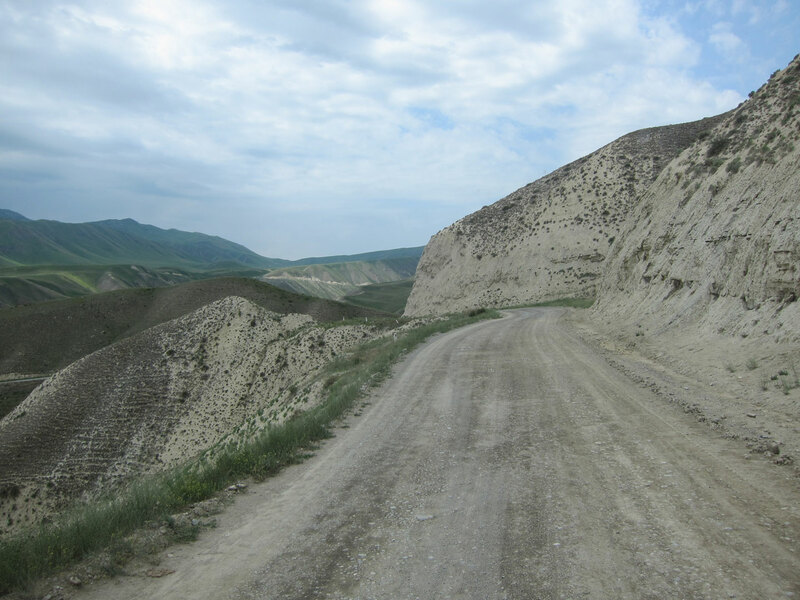 We were happy to not be cycling here as the gravel continued on forever, annoyingly still doing shorter uphills after the main pass. 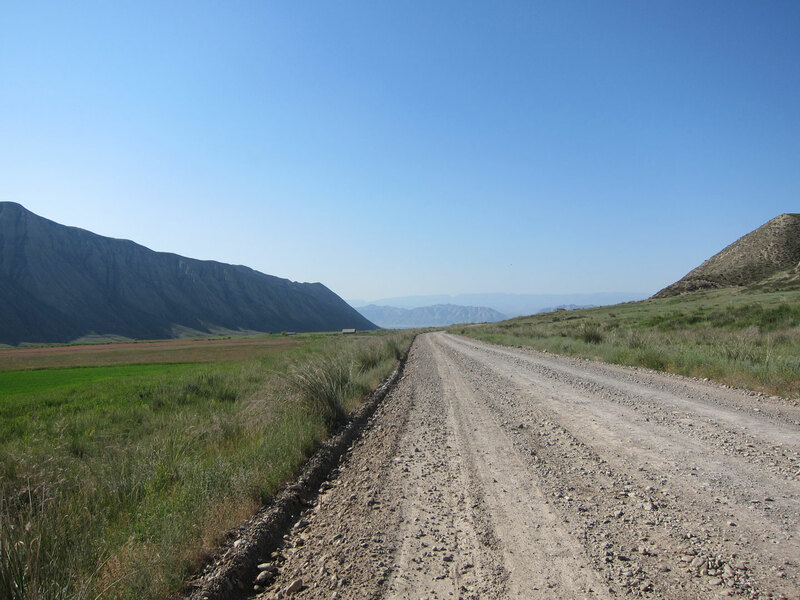 The roads to Jalal-Abad continued to be paved again, but very poorly and often under construction, also no fun when cycling. 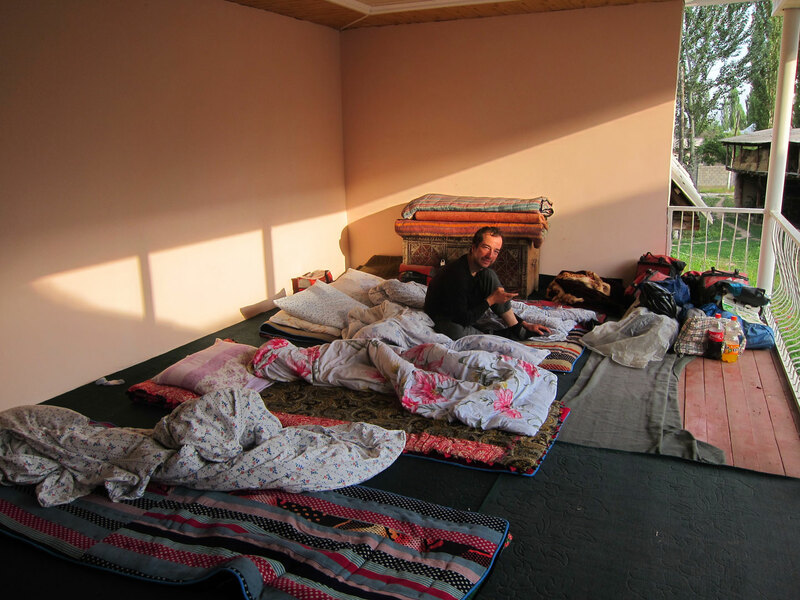 Arriving at our drivers (and now hosts) place, they already prepared mattresses for us to sleep on and we happily crashed out. We couldn’t believe how lucky we were. 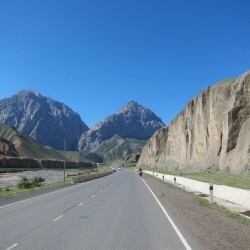 Now we could afford a leisurely cycle to Osh with a rest day there, something that seemed very distant just this afternoon. 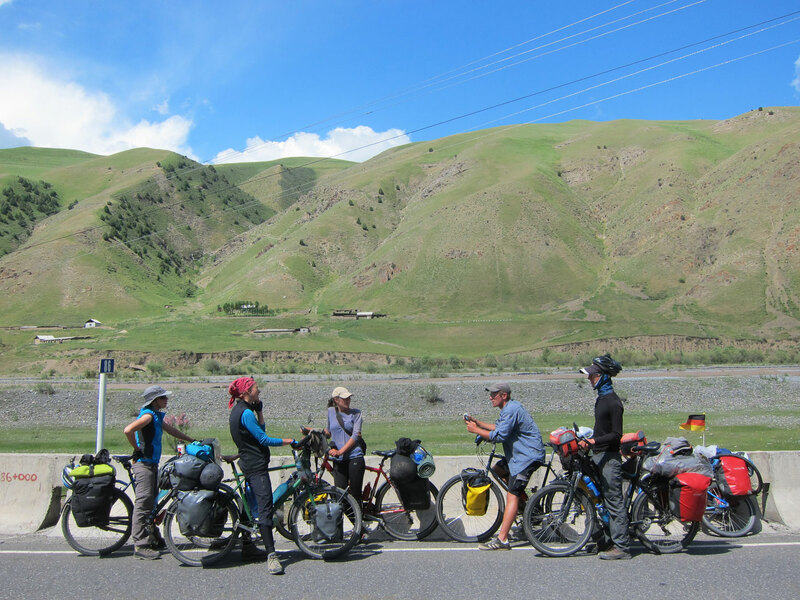 104 km divides two of Kyrgyzstans biggest cities, but considering our efforts in the last two days we decided to still split it in two. 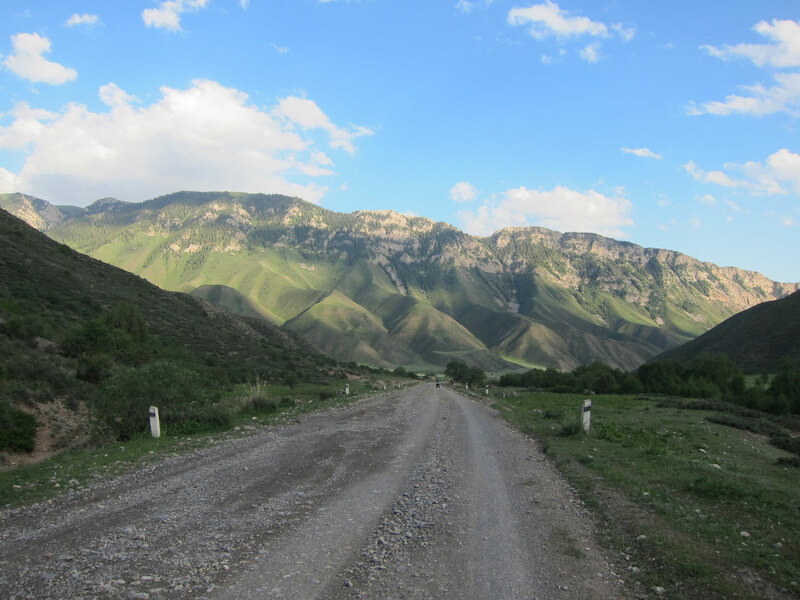 Going out of Jalal-Abad, we noticed this region being much more conservative – many more women in hijabs and men with beard. 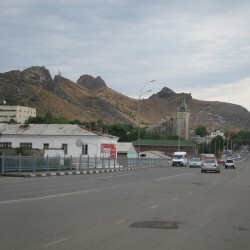 There are many Uzbeks living here, which seem to be more devout to Islam. 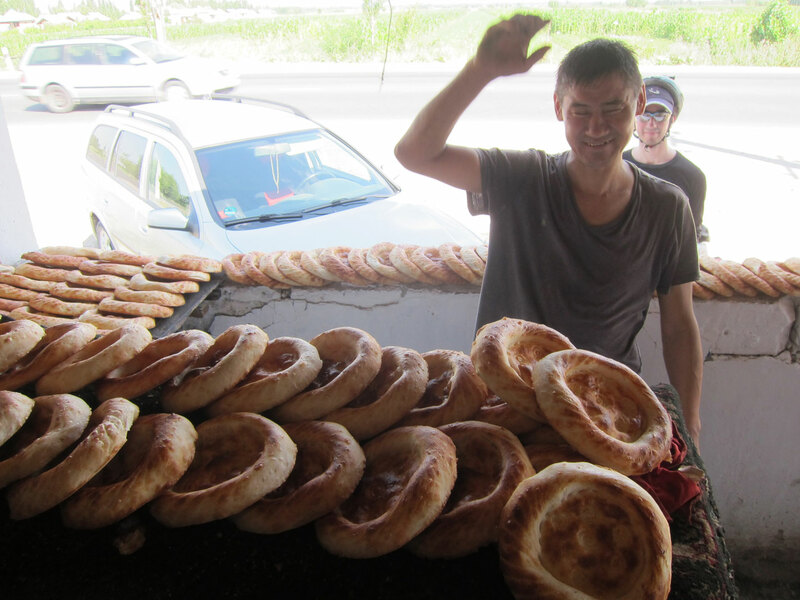 They also definitely look more Turkic than East Asian. 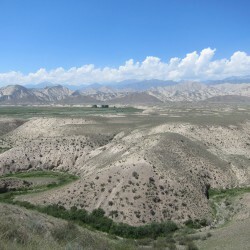 The heat here continued to be brutal and had us pouring sweat on any uphill. 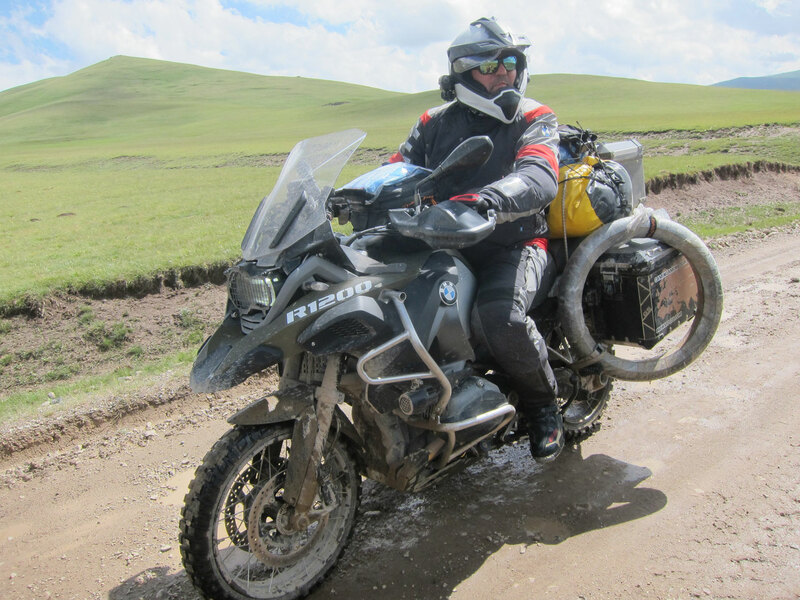 We continued to meet great overlanders, mainly Swiss and Dutch, on motorbikes as we inched forward and rested often in shadows. 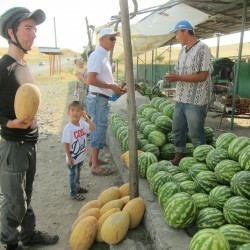 After dinner in a nice roadside cafe we camped in a farm, of which this region has countless since it is so fertile. 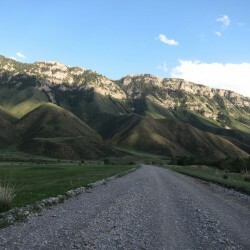 We woke up early to have a nice cool morning run into Osh and enjoy the afternoon and next day relaxing. Which is exactly what we did. 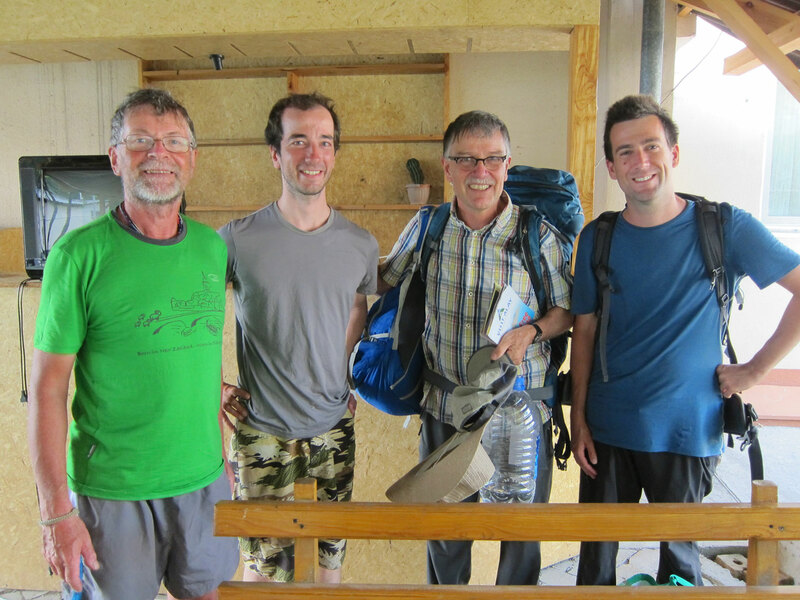 A rather upscale place, TES Guesthouse, let us camp for KGS900 while including breakfast and use of all facilities. 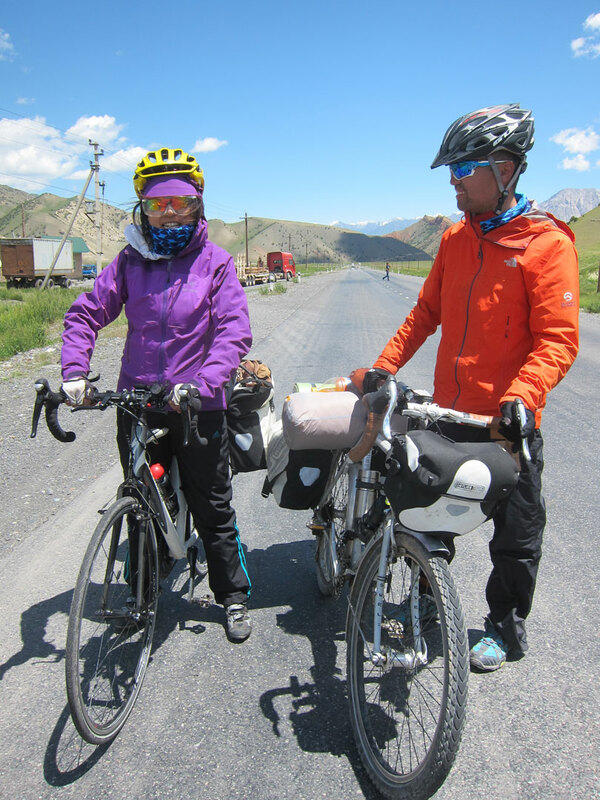 Once there we got into contact with several other guests, one of whih also had a touring bike, an almost retired Swiss man, and two other Swiss who claimed to have seen us from a bus on the road. They were about to leave for China on a night bus and we gave them several tips, our last RMB and the Chinese SIM card, which they were very grateful for. We had a couple of things to take care of, but didn’t get our butts moving until afternoon. 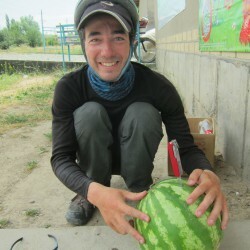 I got a message by Timo, a Bulgarian I met in Bishkek, to meet at the bicycle area of the bazaar, where we hoped to find a new tire for Yuilys bike. 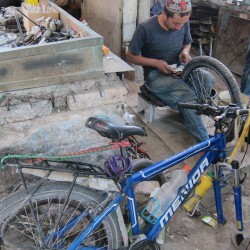 One of the men in the market handled all repairs – he was quite knowledgeable. 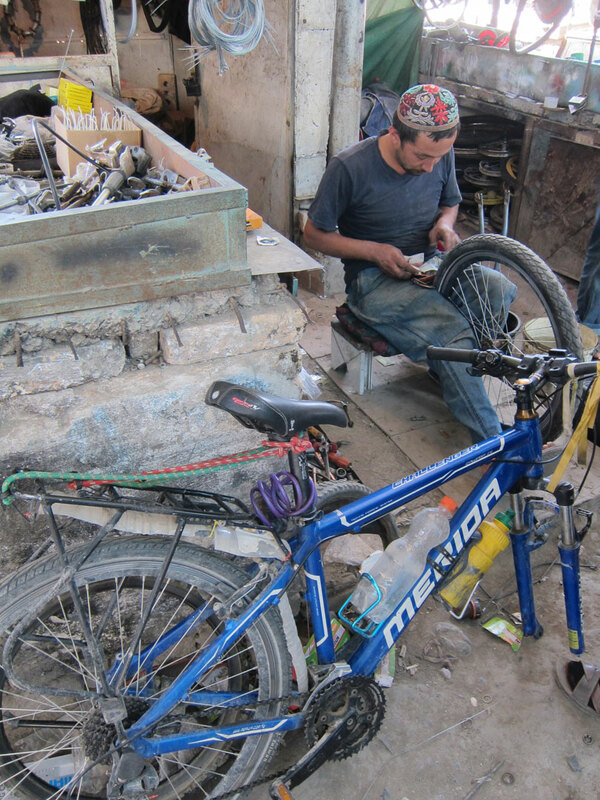 He changed the bearings on Yuilys bike for free and recommended a shop to buy a tire from, where we found a cheap Chinese one for KGS600. 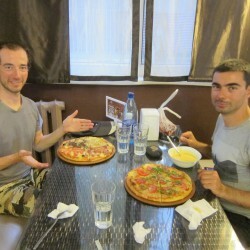 We later invited Timo for dinner since he helped us a lot translating from Russian. 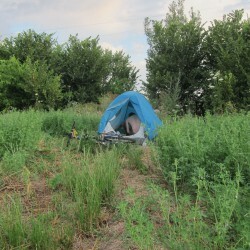 Rain was falling all night and soaked the laundry we did the previous evening. We used the cheap tent, so some water got inside, too. 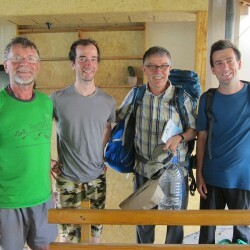 We put everything under the veranda of the guesthouse in the hope it would dry. It just kept raining hard with little breaks. Our clothes didn’t dry and we still had shopping to do, but no way to get out. Around 5 pm it finally eased. We knew it would be too late to leave, so checked in for another night. 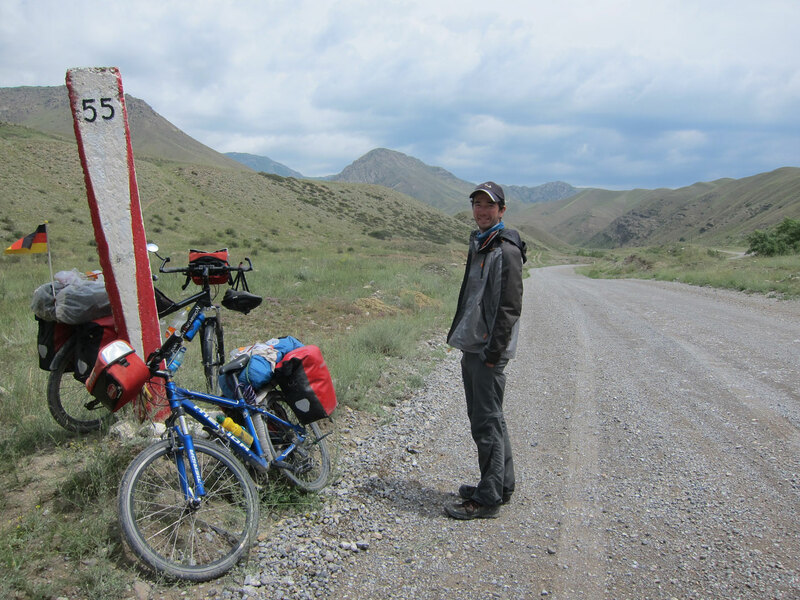 When I asked, the receptionist told me there was no way of getting the type of gas canister our stove needed in Osh. 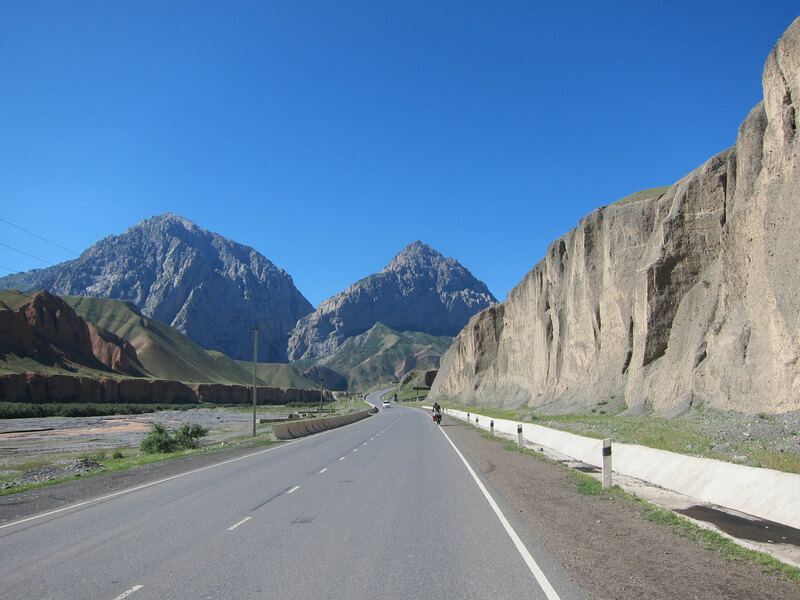 A slight problem as the remote Pamir highway lay ahead of us! 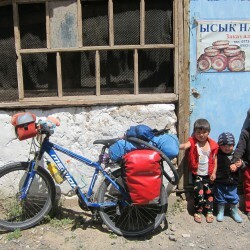 Cyclists commonly use a multifuel stove like the MSR Whisperlite. Those are dirty, soot-spewing monsters with the sound of a jet engine and little temperature control, but loved for the fact that they can burn most liquids, most notably petrol from any gas station. 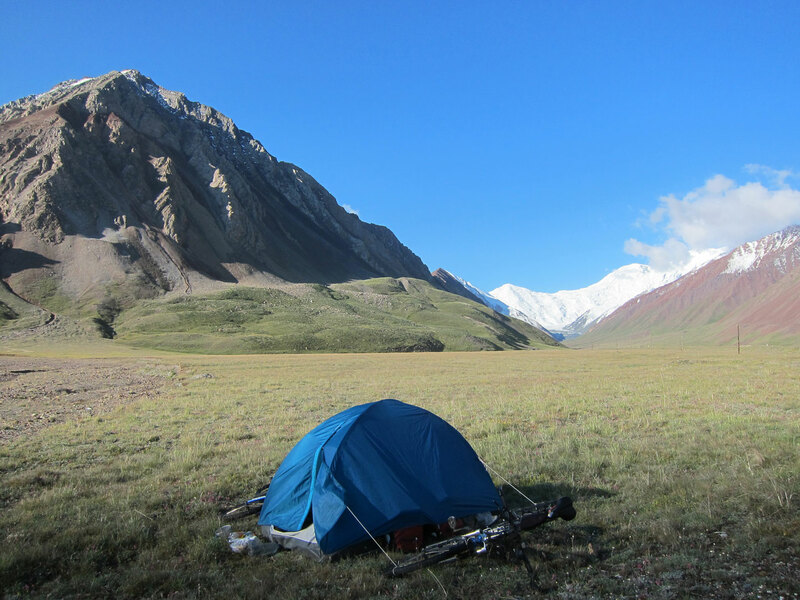 Our gas stove has served us really well so far – it’s quiet, clean, compact, produces a lot of heat, has excellent temperature control and can be used inside the tent. Finding gas is more tricky than petrol, but in big cities it was usually acquireable and would last us a month or longer. During my research I found a way to make an alcohol stove out of a beer can. I decided to give it a try. Sure enough, a nearby pharmacy had 95% medical alcohol. I cut up a can and presto – it worked! 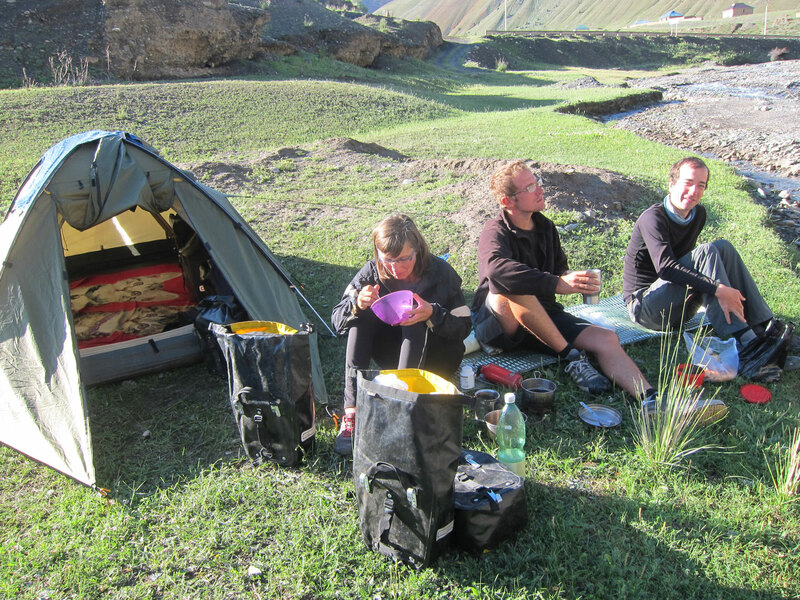 It seemed like we wouldn’t eat cold on the Pamirs. After indulging once more on the delicious free breakfast, we were off for good. 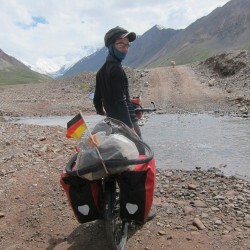 4 days were left on Yuilys visa and 230 km with a lot of climbing lay between us and the border – we needed to get moving. 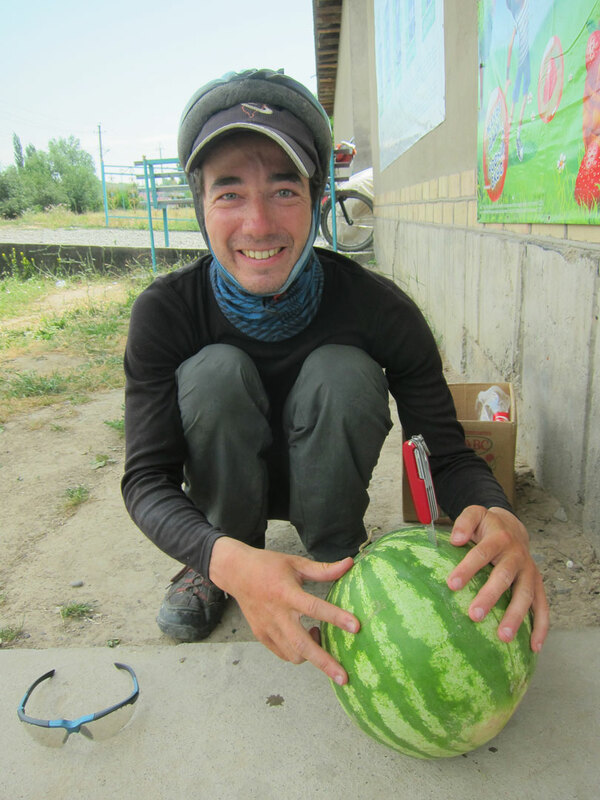 Not far out of the city we were having a watermelon break as two Polish cyclists rolled up. 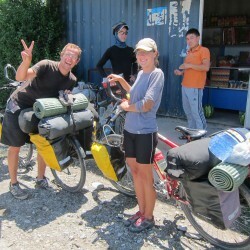 Dominica and Lukasz were on the same route as us, except having more days to reach the border. 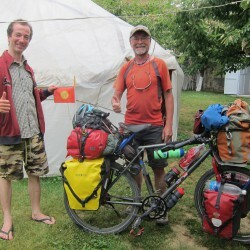 We teamed up and started cycling together. This ended up being a blessing. 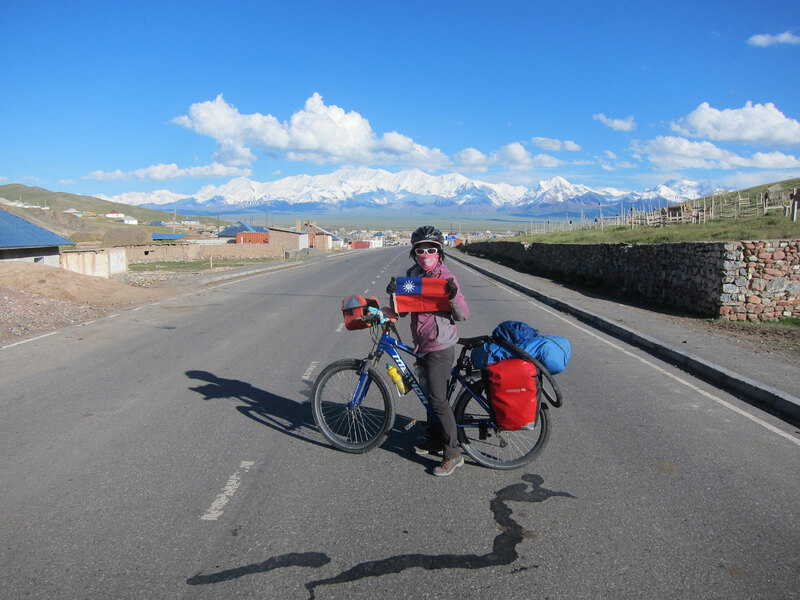 Mine and Yuilys speeds are quite different and cycling ends up either with me waiting for her to catch up or her exhausted going my speed. But their speed was right in between, so we made excellent progress. 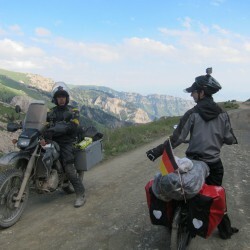 Lukasz was quite extroverted, speaking good Russian he immediately befriended many locals on the way. Cycling with them proved to be really fun. 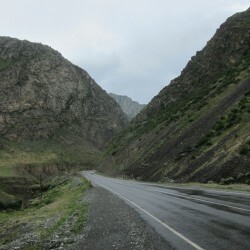 The road gently followed a river before steeply climbing up to a pass. 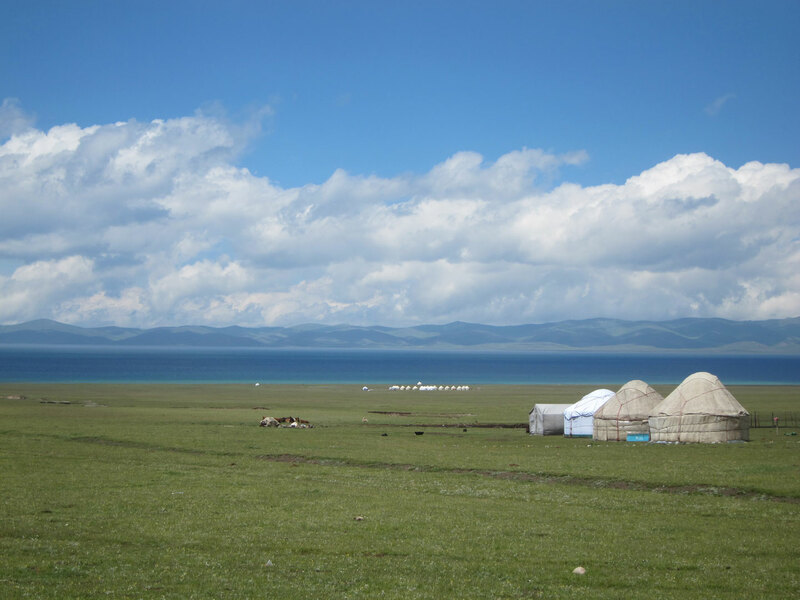 We wanted to make camp before that and a yurt village appeared. We asked for permission and quickly got it. A nice evening cooking dinner and plenty of chatting followed. 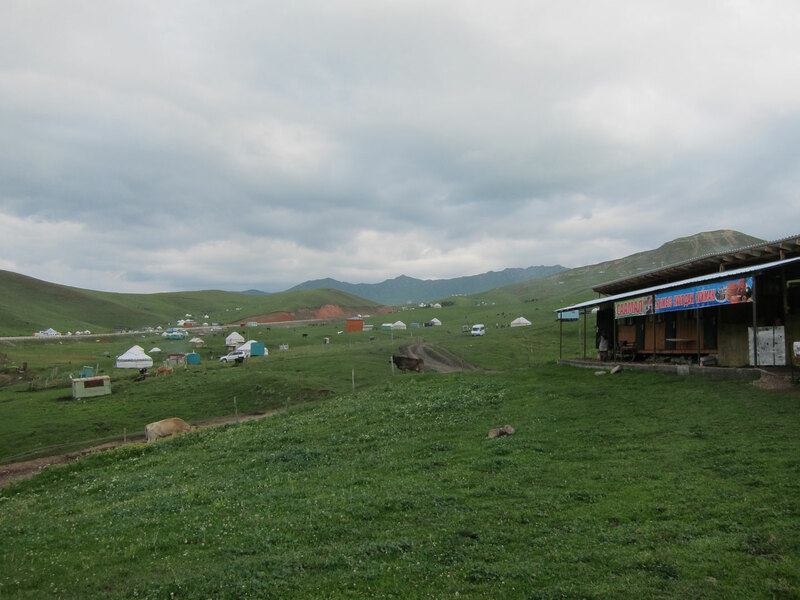 … in a yurt village. 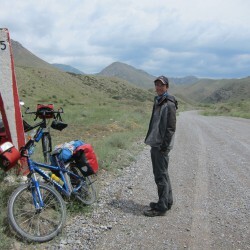 We quickly summited the pass and cruised down, gaining a quick 20 km. From here the climbing started again, similar to yesterday following a river. Once again we made excellent progress, a small landslide perfectly happening at lunchtime. While that was being cleared, the locals from the waiting cars took an interest in our bikes. 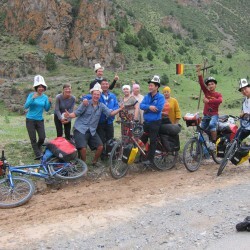 Lukasz encouraged them to pose and take photos while they left us plenty of snacks and drinks, even two Kyrgyz hats! Awesome! 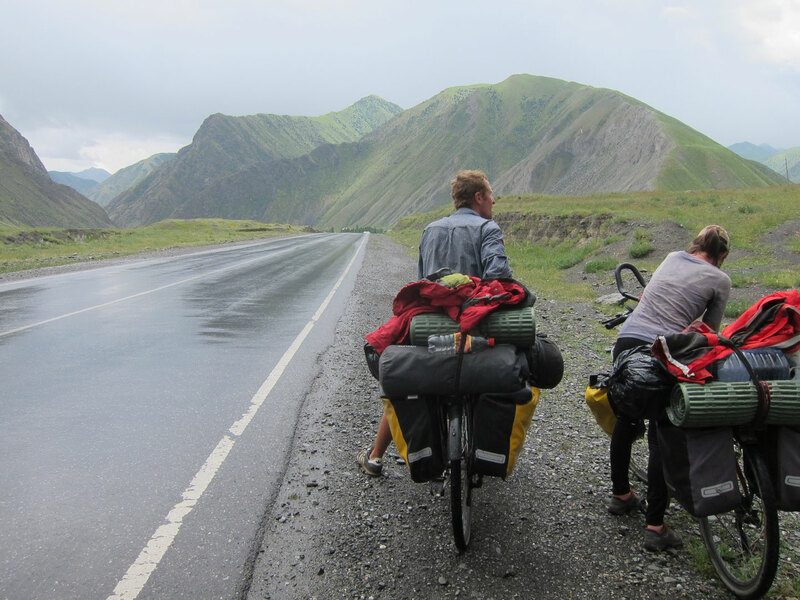 Rain got us going again – it was light enough to keep cycling and soon enough we passed our daily distance. 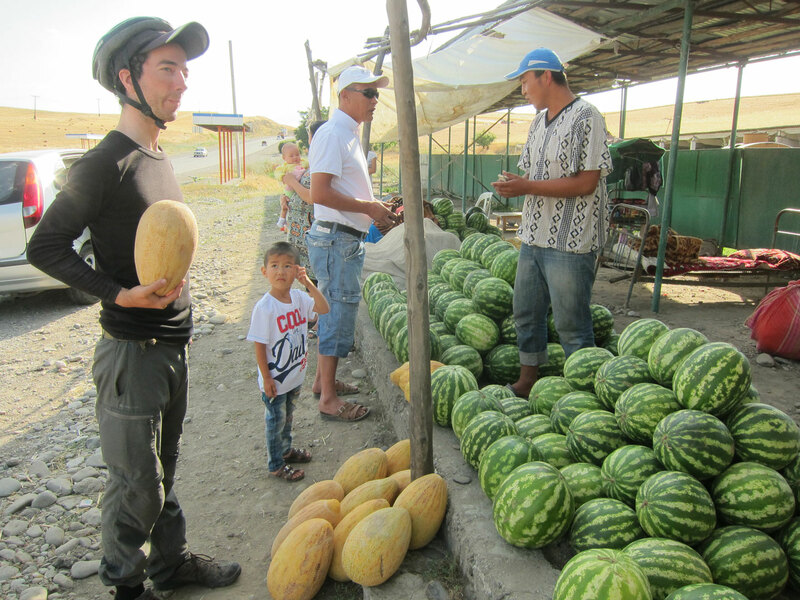 Lukasz asked a truck driver if he could sell us one of the watermelons he was carrying, but instead he just gave it to us for free. Very nice. While looking for a spot to eat it the rain started again, this time with more menacing clouds. A quick decision was made to camp right there, a bit earlier than usual. 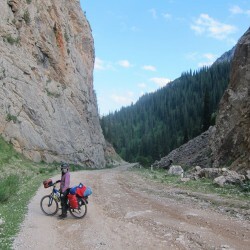 The climbing continued and started to do some switchbacks as the scenery became spectacular. 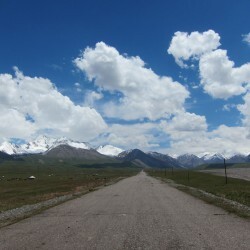 We knew the 3600 m Taldyk pass was ahead of us. 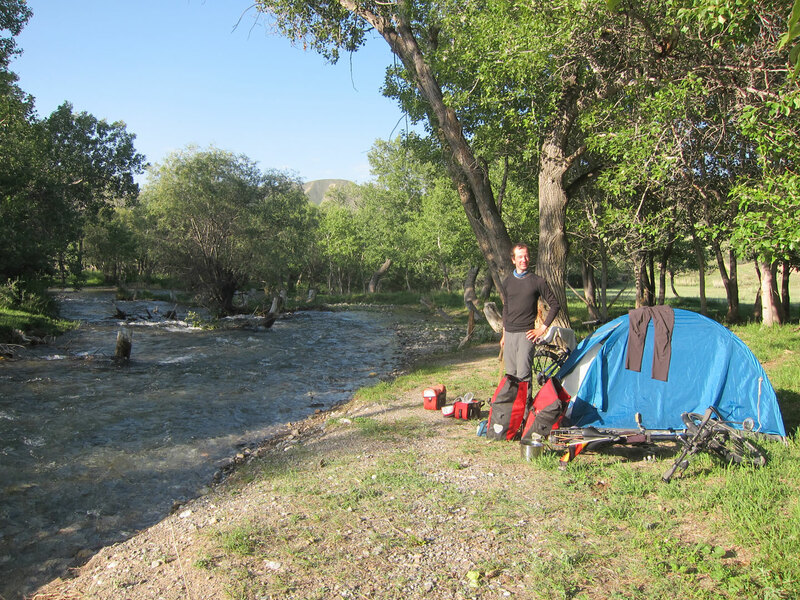 After just 20 km Dominica and Lukasz decided to camp – fair enough, considering they had to wait 4 more days for their Tajik visas to start. 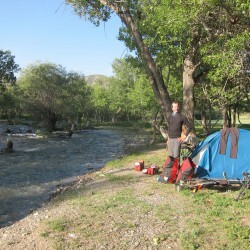 Camping here was better than sitting ducks in Sary-Tash, the border town. 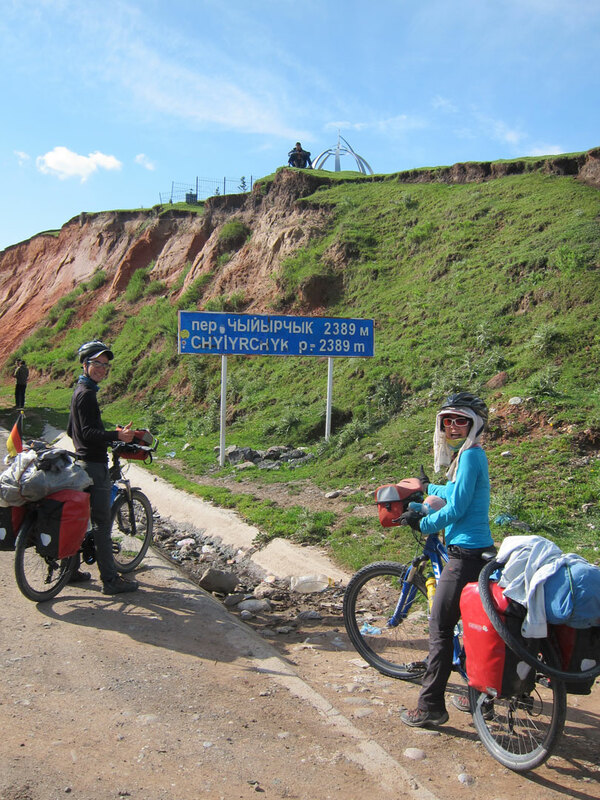 We didn’t have this luxury, with just two more days on Yuilys visa, we needed to reach Sary-Tash today. 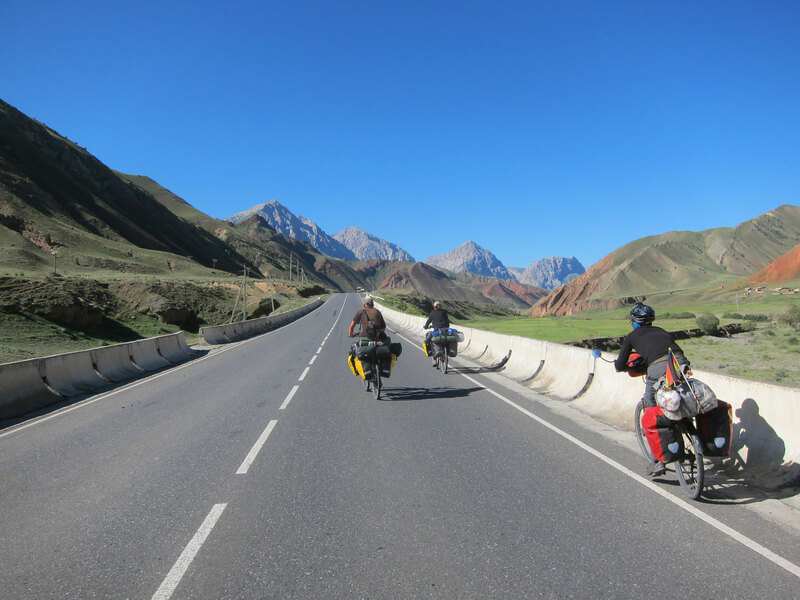 So we said goodbye to our companions – maybe they will catch us on the Pamir highway. It was really fun with them and we missed them instantly. The pass was hard, hard work. 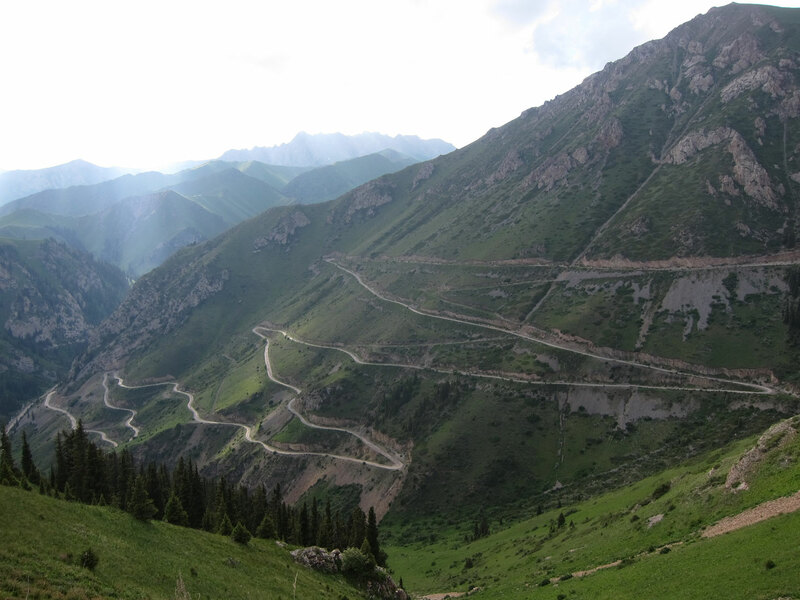 The last 5 km had switchbacks which were really steep and took us almost 2 hours. 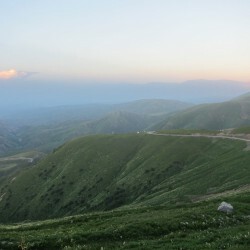 On the top we met two other cyclists and a motorbiker before descending. 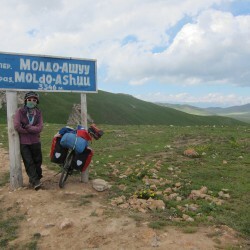 Annoyingly a sign appeared, telling us of another two kilometers uphill. This really annoyed us and took the last of our energy. 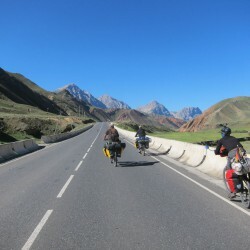 We couldn’t focus on our fatigue though as on the downhill the majestic Pamir mountains appeared in front. 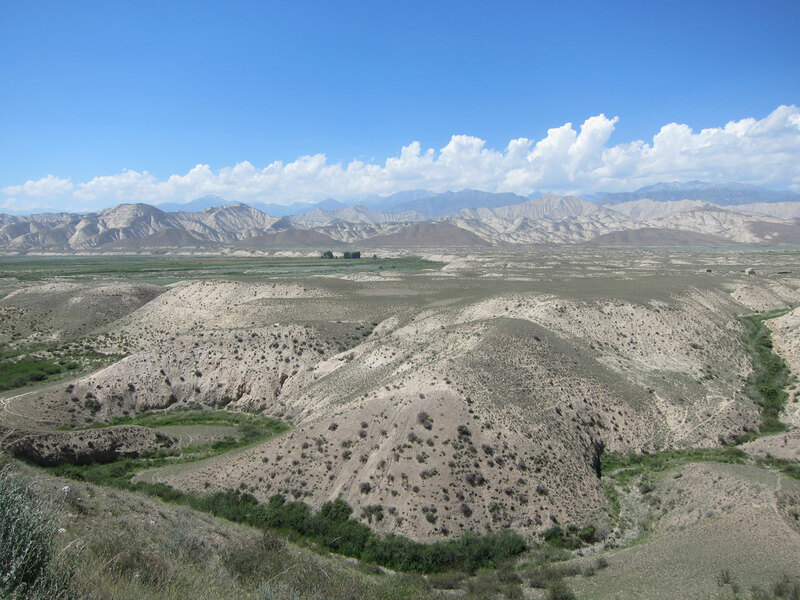 Its 7000+ m peaks were nothing like we’ve ever seen before. 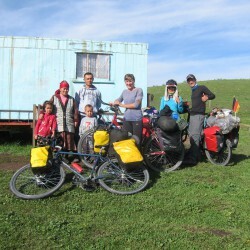 We reached Sary-Tash and checked into a guesthouse. 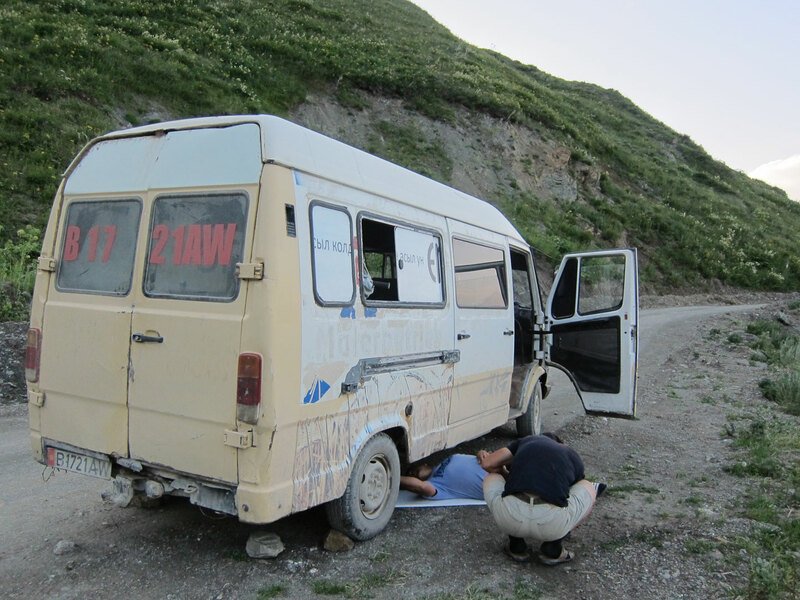 The next place we could charge was Murghab in Tajikistan, 250 km away on the Pamir plateau, so we needed every bit of battery juice we could get. 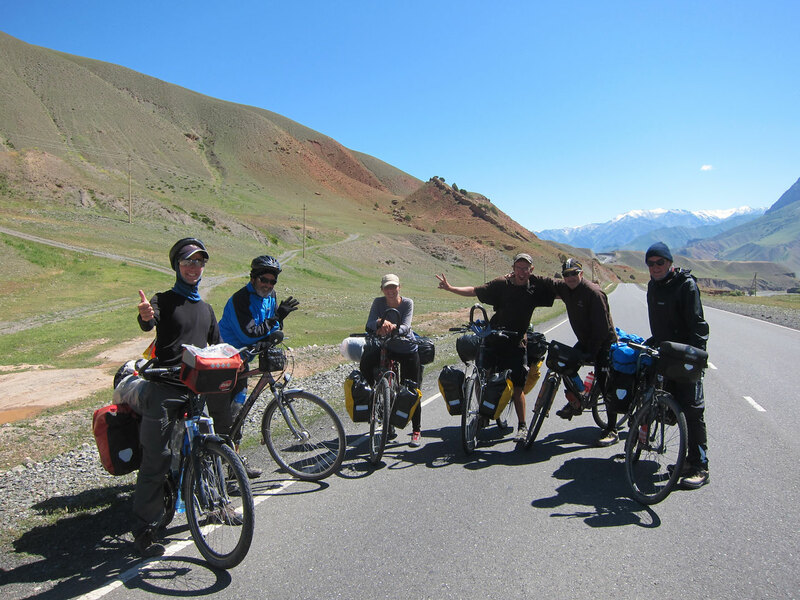 Four other cyclists stayed there who just finished the Pamirs, so we had a nice chat. Dinner and breakfast was included, so we never had to leave the premises. 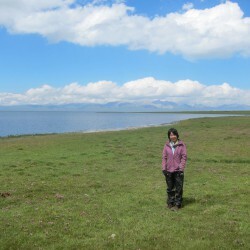 The job left to do was to get out of Kyrgyzstan as it was Yuilys last day on her visa. 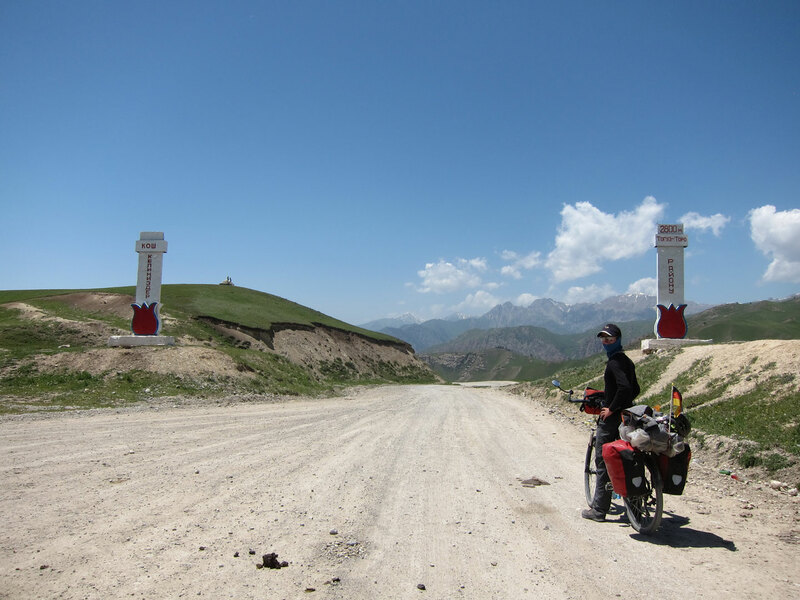 While the actual border is on the 4290 m Kyzyl-Art pass up some very bad roads, the Kyrgyz border post is just 27 km from Sary-Tash before the climbing really begins. Therefore there was no rush. 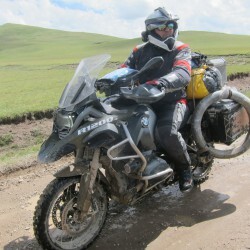 I changed the tire on Yuilys bike to the wider one so it could handle the gravel better. It also looked more badass now with 55 mm tires. After another nap we were off. 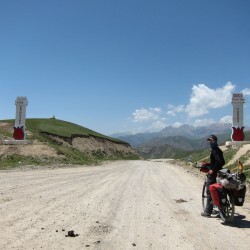 The road stayed ok with a few potholes until the Kyrgyz border check. I was quickly stamped out, but the officer checked Yuilys passport and visa a lot longer. For a moment we were worried, but the stamp came and we were free to go. It was too late to make the pass, so a night in No-Man’s land was on the task. 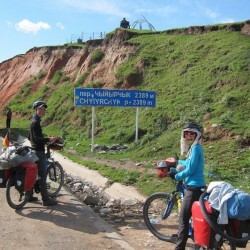 I wanted to go a little further, but Yuily was feeling lazy and wanted to camp, the visa pressure finally being off her. It seems her lazyness works as a weather radar, as big rainclouds moved in to have us camp anyway. 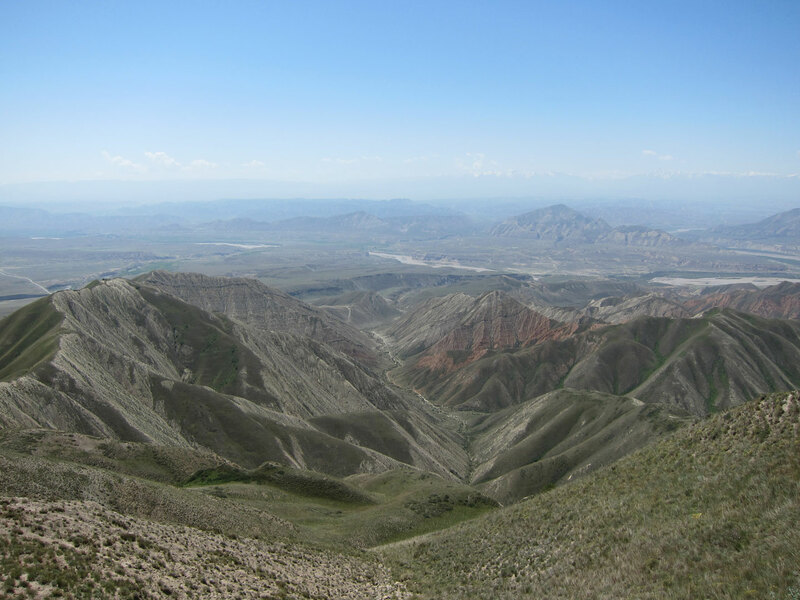 Well, all the tales about the natural beauty of this place are true. 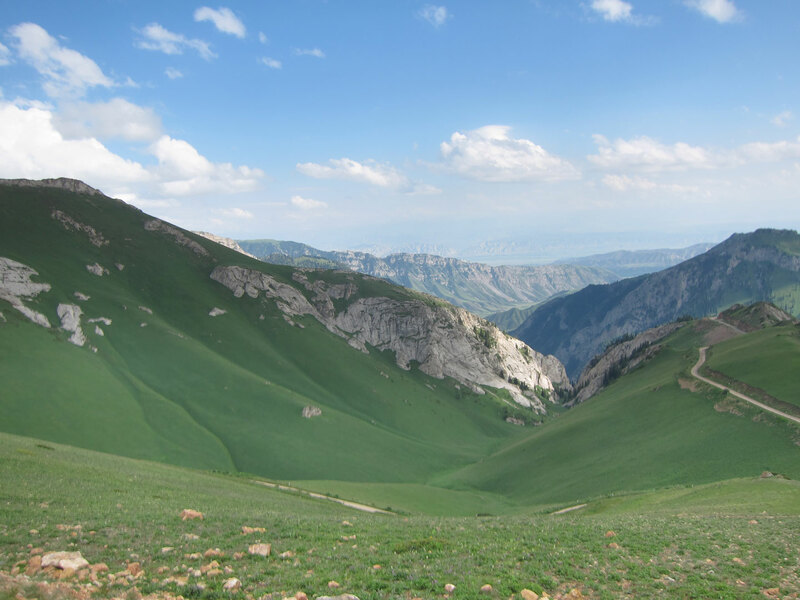 Almost no flat land, the country is covered in all kinds of spectacular scenery, while even offering an ocean with Issyk-Kul. 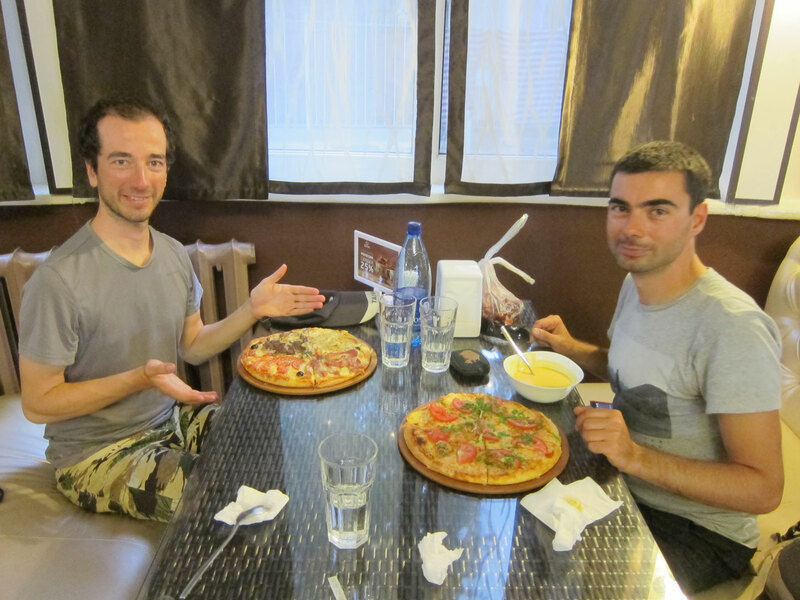 While I didn’t experience the same overwhelming hospitality as in Kazakhstan overall, we still met a fair share of genuinely friendly people. 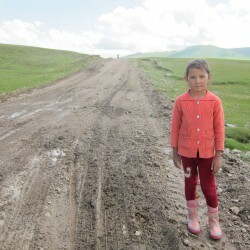 Kyrgyzstan is full of kids. Having a new one every year is normal for a family, up to 6 total. Most of them were awesome, running out of the houses on sight of us, collecting high-fives. But a few seriously annoyed me by being demanding, not understanding the word “no”.